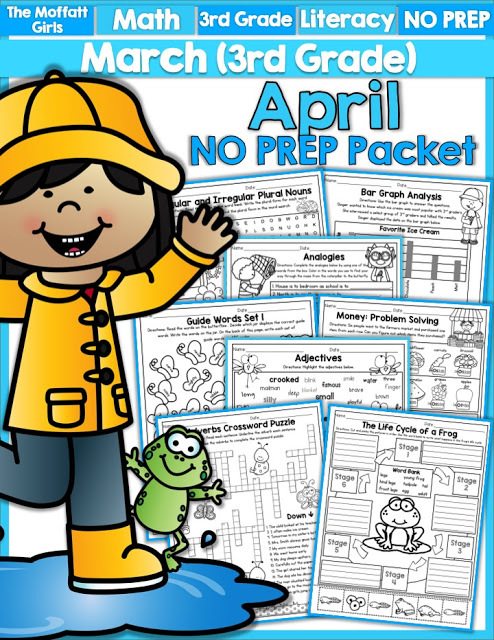 April is nearly here and we are geared up for some fun spring-filled learning! This month we are keeping it rigorous and FUN! 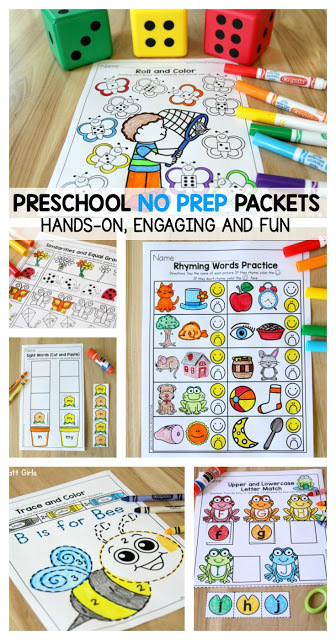 The preschool packets are FILLED with hands-on and engaging activities for little learners! 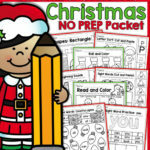 This packet 70 page packet will cover cutting skills, coloring, tracing, letter identification, one to one correspondence, similarities and difference, counting practice, sight words, sequencing, shapes and much, much more! Here are a few of the pages in this massive packet! 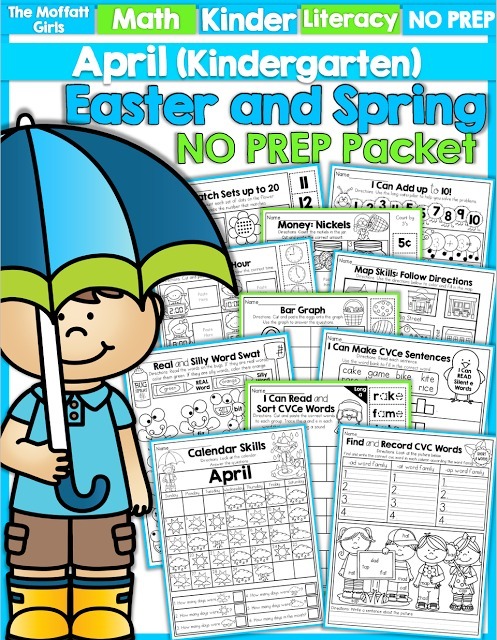 *Read and Sequence: Eggs in my Basket- Read the story, cut and paste to sequence the events. 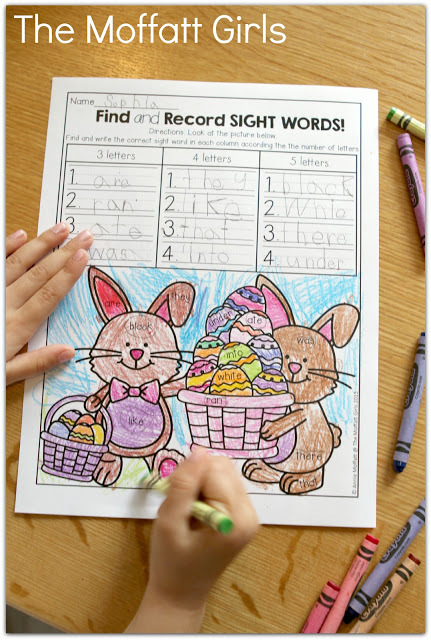 *Find and Record Sight Words- Find the 3, 4 and 5 letter sight words in the picture and record them in the correct columns. *Real Word or Silly Words? Roll a die, read a word and color by the code. *Long and Short Vowels (a vowels)- Say the name of each picture. Color each picture by the code, according to the long or short vowel sound. 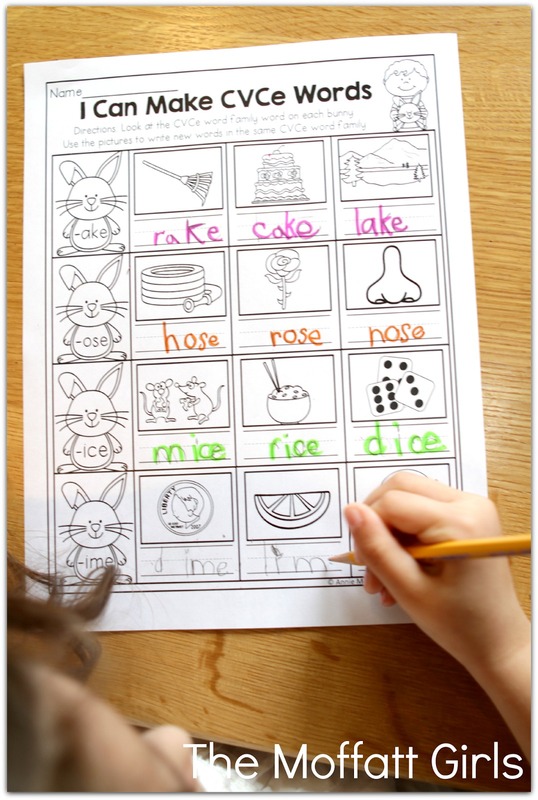 *Long and Short Vowels (e vowels)- Say the name of each picture. 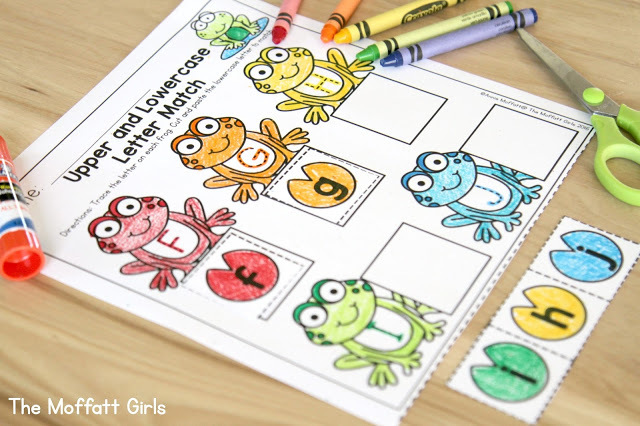 Color each picture by the code, according to the long or short vowel sound. 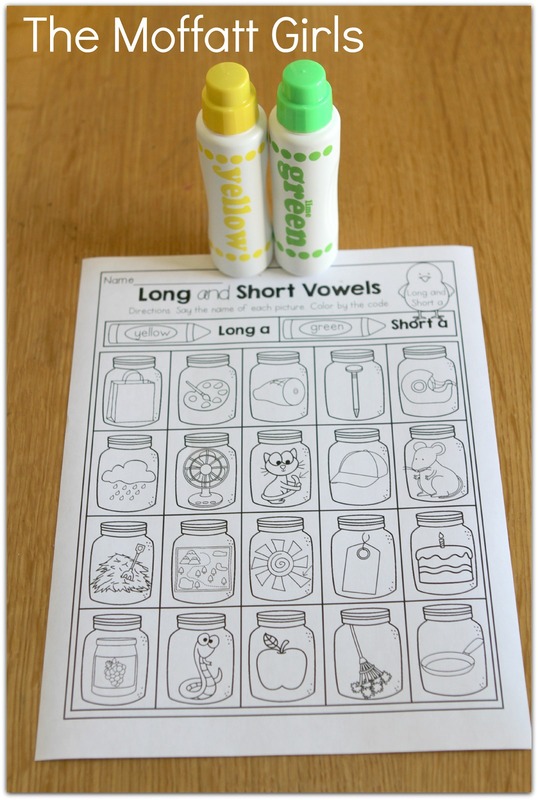 *Long and Short Vowels (i vowels)- Say the name of each picture. 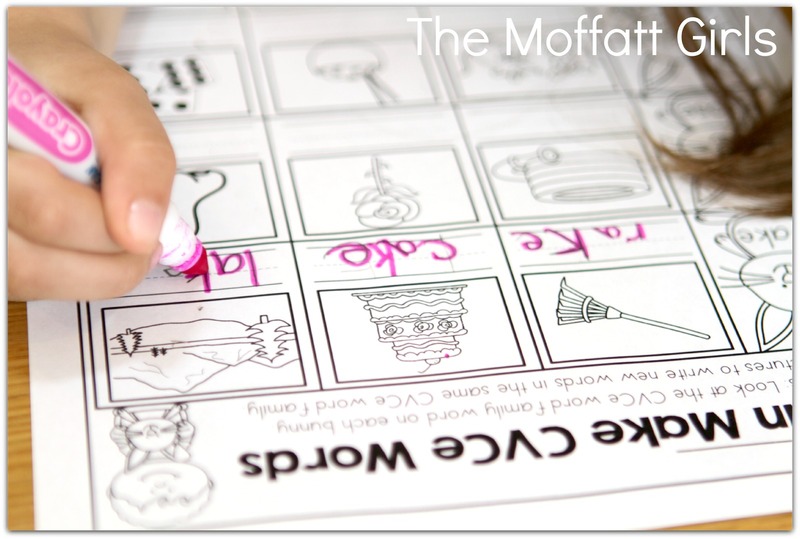 Color each picture by the code, according to the long or short vowel sound. 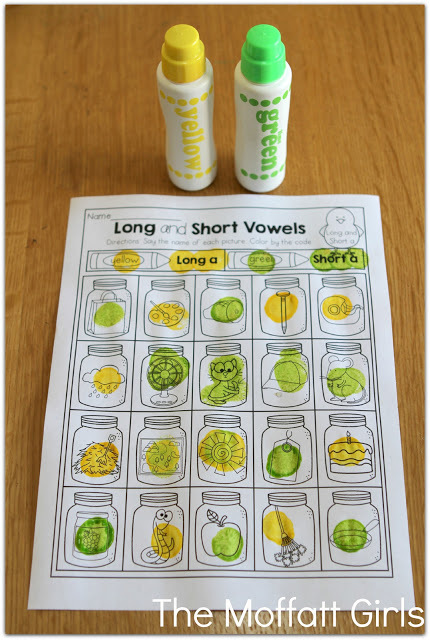 *Long and Short Vowels (o vowels)- Say the name of each picture. 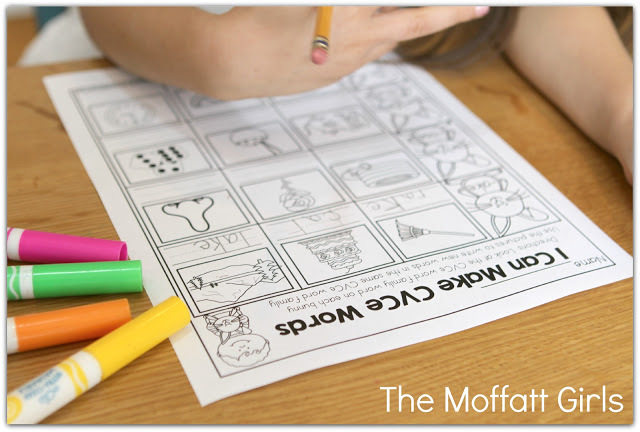 Color each picture by the code, according to the long or short vowel sound. *Long and Short Vowels (u vowels)- Say the name of each picture. Color each picture by the code, according to the long or short vowel sound. *Positional Words- Listen to the directions. 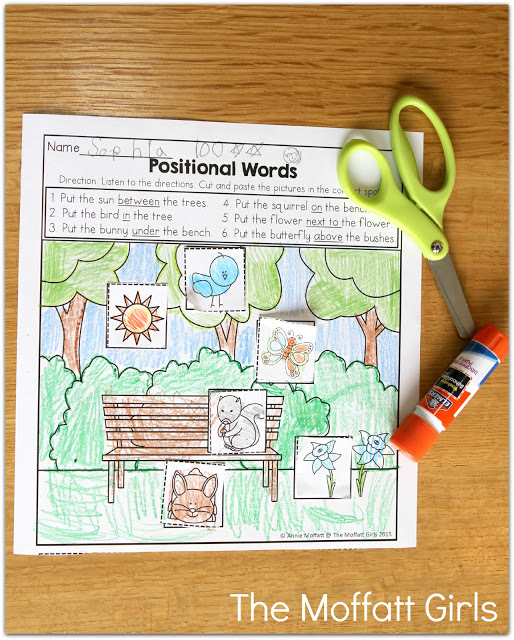 Cut and paste the picture to the correct spots according to the positional words. 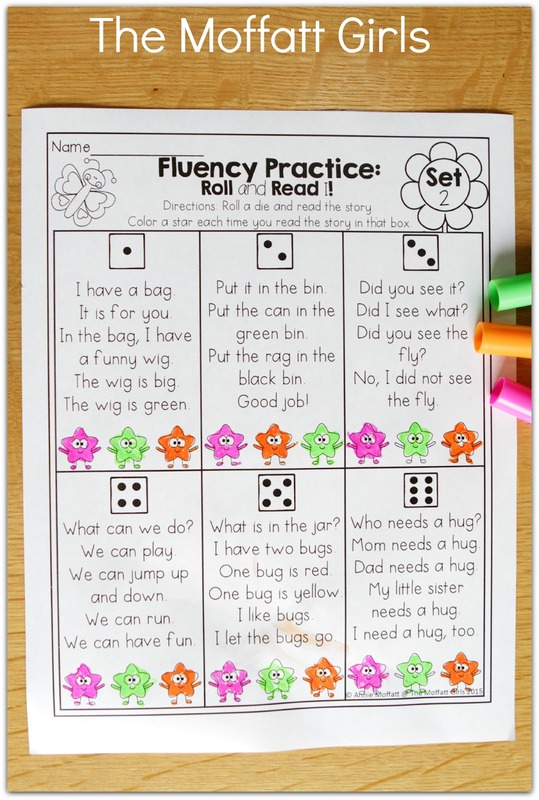 *Roll, Read and Trace a Sight Word (Set 1) – Roll a die, read and trace a sight word. *Roll, Read and Trace a Sight Word (Set 2) – Roll a die, read and trace a sight word. 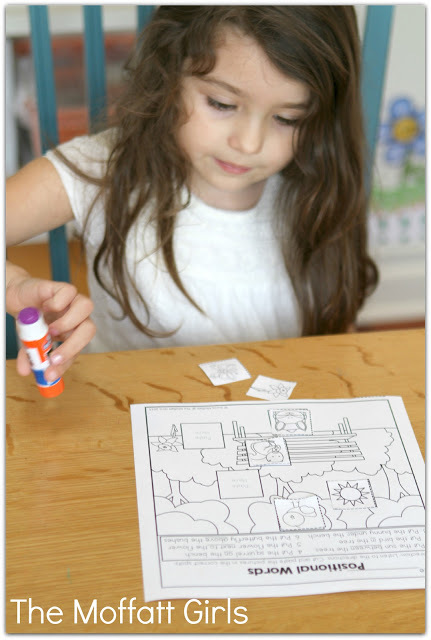 *Beginning L-Blends- Cut and paste the pictures to the correct blends. *Beginning R-Blends- Cut and paste the pictures to the correct blends. *I Can Make CVCe Words! Look at the CVCe word family word. Use pictures to write new words in the same family. 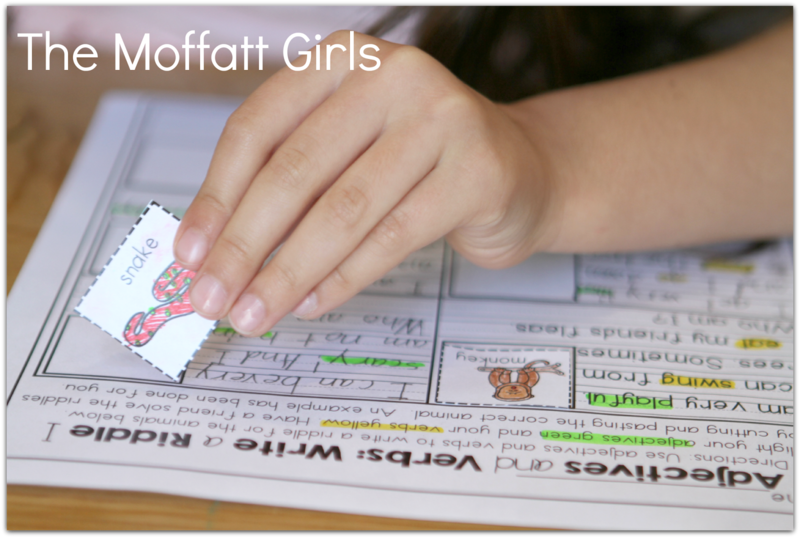 *I Can Read and Sort CVCe Words- (Long a) – Cut and paste the correct words to each group. Trace the a and e in each word that makes the long a sound. *I Can Read and Sort CVCe Words- (Long i) – Cut and paste the correct words to each group. Trace the i and e in each word that makes the long a sound. *I Can Read and Sort CVCe Words- (Long o) – Cut and paste the correct words to each group. Trace the a and i in each word that makes the long a sound. *I Can Make CVCe Sentences!- Read the simple sentences. 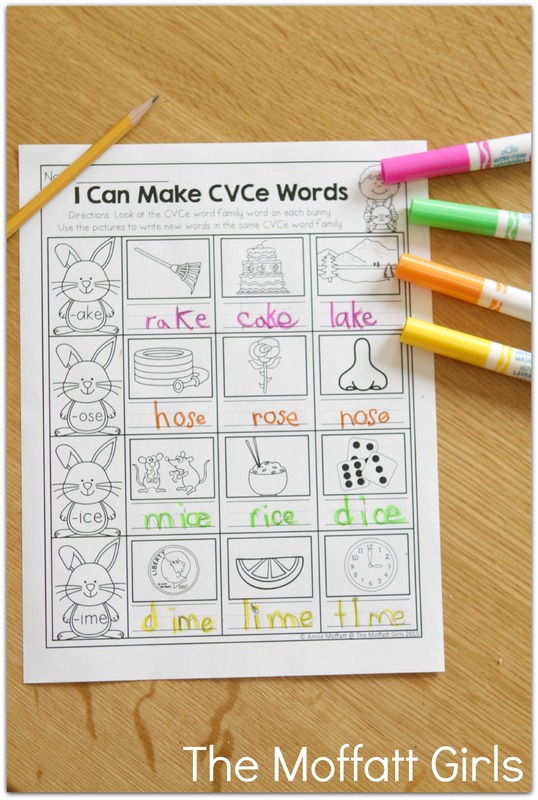 Use the CVCe words in the word bank to fill/ box in the correct word for each sentence. *Fluency Practice (Roll and Read) Set 1- Roll a die and read the short story. 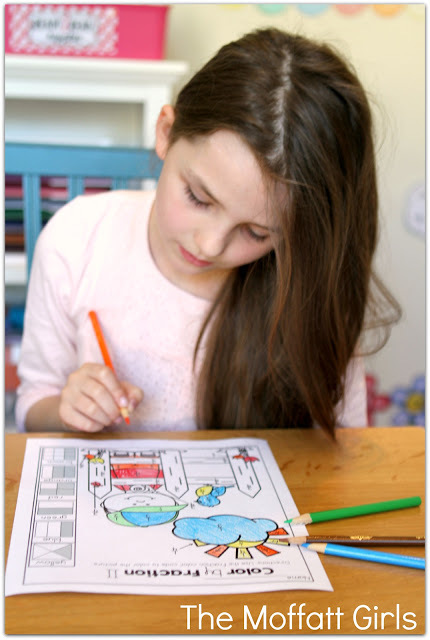 Color a star each time you read a story in that box. 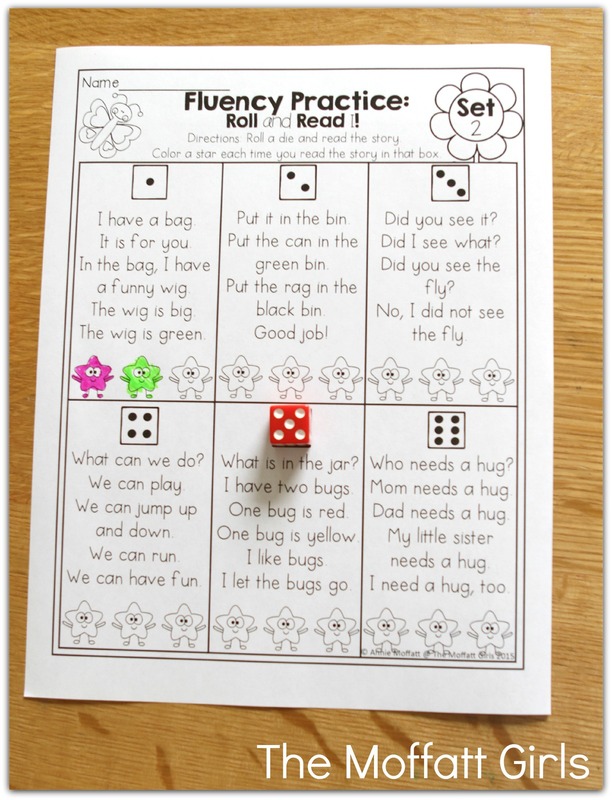 *Fluency Practice (Roll and Read) Set 2- Roll a die and read the short story. Color a star each time you read a story in that box. *Real and Silly Word Swat- Read the words on the bugs. 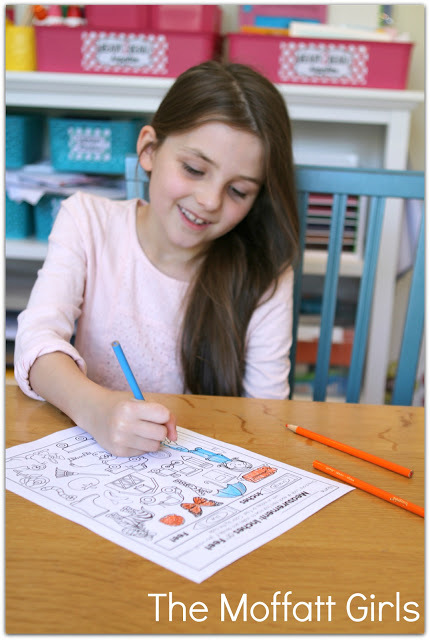 Color according to the code (real and silly words). *Rhyming Words (CVC Words)- Read the beginning word on each caterpillar. 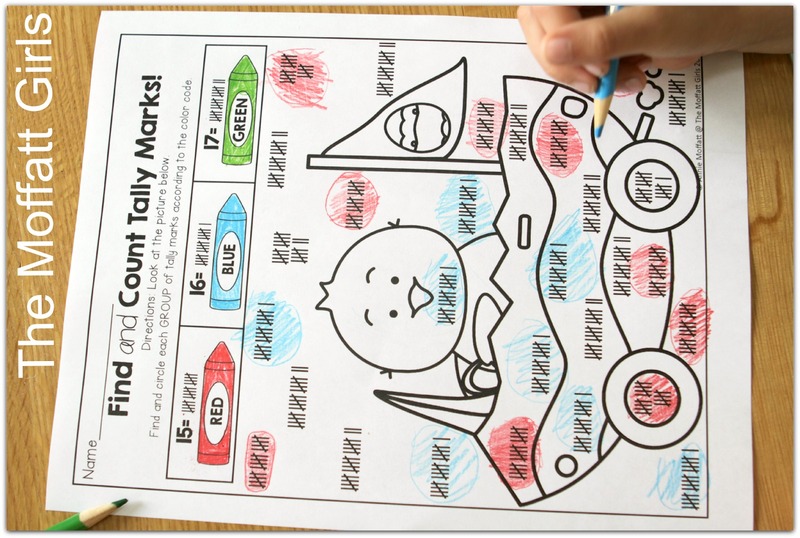 Color the body parts according to the color code. (Rhyming words/non-rhyming words). *Rhyming Words- Read the words on the bunnies. Cut and paste the word that rhymes. Use some of the words to make 2 sentences. 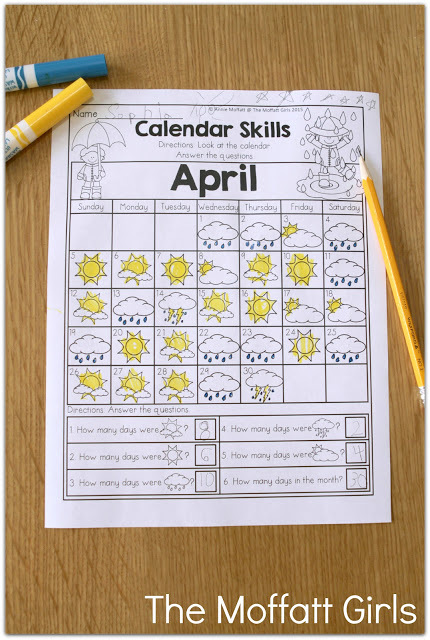 *Calendar Skills- Look at the weather pictures on the calendar and answer the questions. 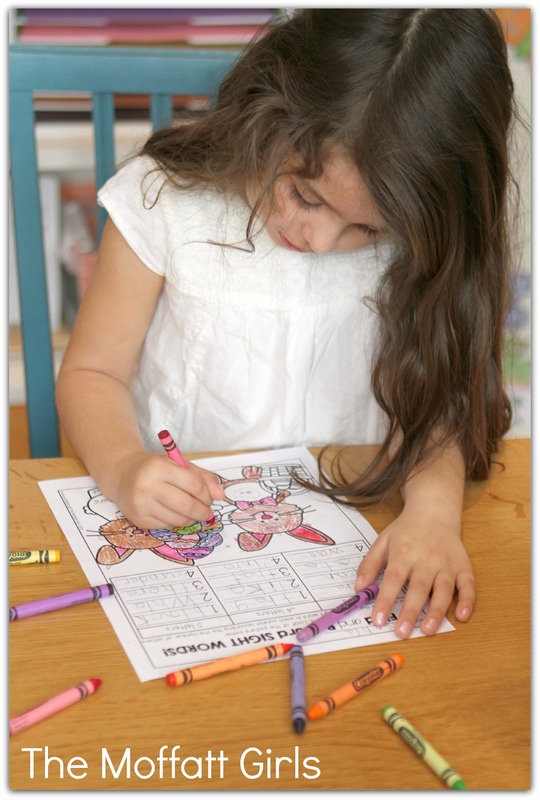 *Ordinal Numbers-Read the color and ordinal number clues to follow directions and color the tulips. *I Can Write Numbers to 100- Trace and fill in the missing numbers from 1-100. *Find and Count Tally Marks (#15-17)- Find and circle each group of tally marks according to the color code. *Place Value- Count and record each set of tens and ones. *Spin and Color a Number (#11-15) I- Use a paperclip spinner to spin a number word. 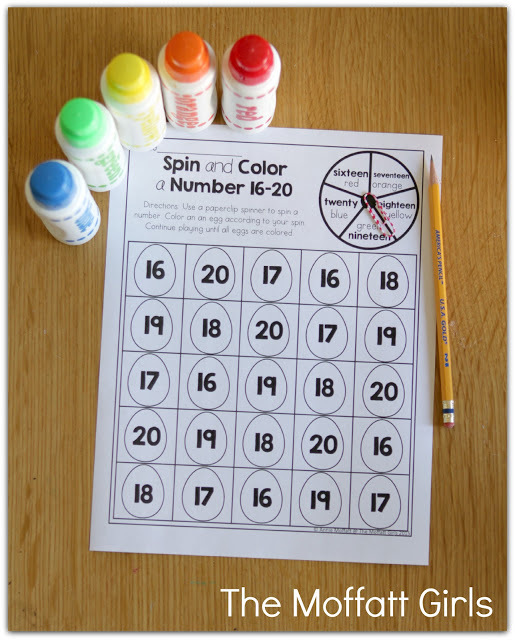 Color the egg with the matching number according to your spin. 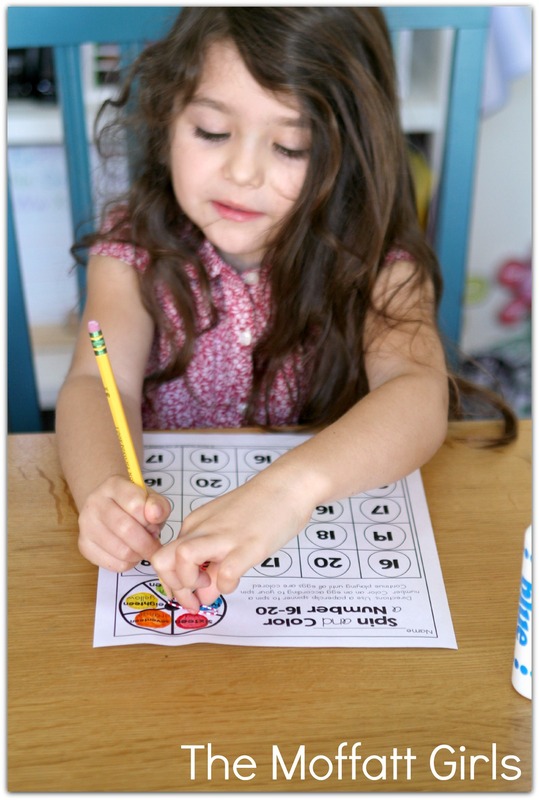 *Spin and Color a Number (#16-20) II- Use a paperclip spinner to spin a number word. Color the egg with the matching number according to your spin. 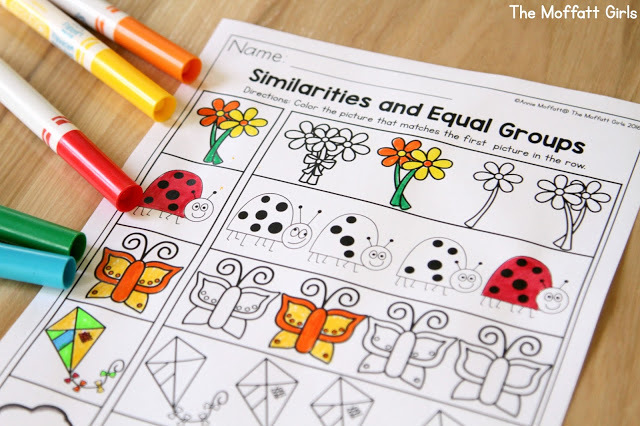 *Bar Graphing I- Use the color code to color and graph the butterflies. 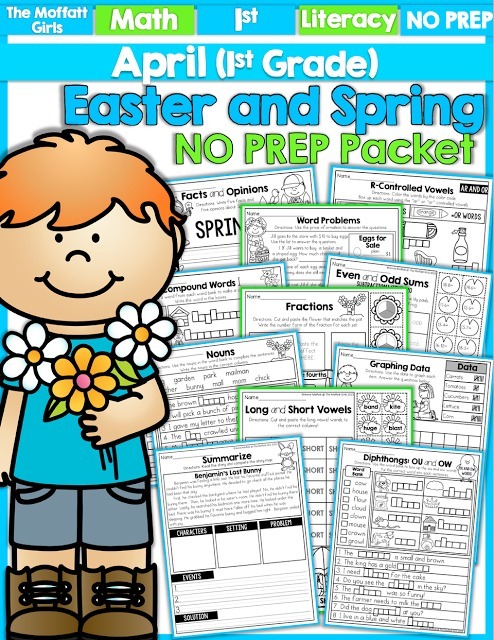 *Bar Graphing II- Cut and paste the eggs onto the graph. Use the graph to answer the questions. *Time to the Hour- Cut and paste the clocks that match the digital time by the hour. 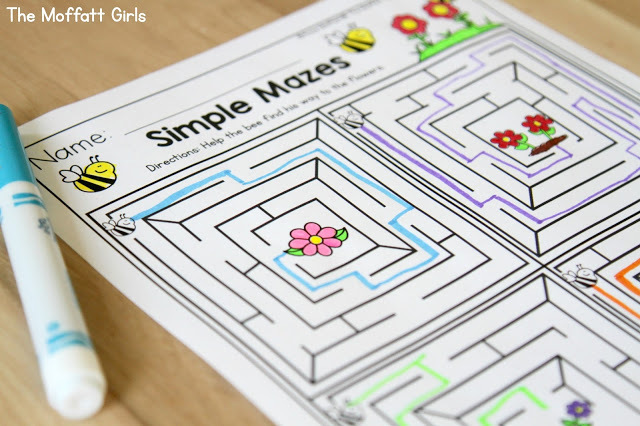 *Map Skills: Follow Directions- Use the directions to color and fill in the map. 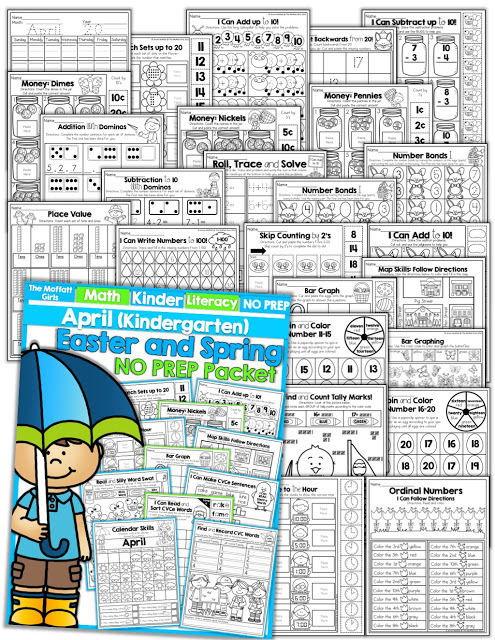 *Skip Counting by 2’s- Cut and paste the numbers from 2-20. 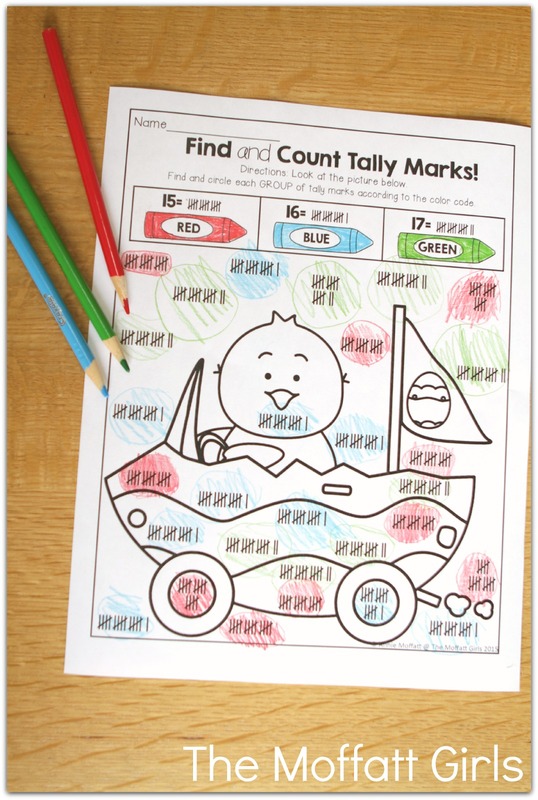 Skip count by 2’s to complete the dot-to-dot. *I Can Add to 10!- Solve the addition problems. 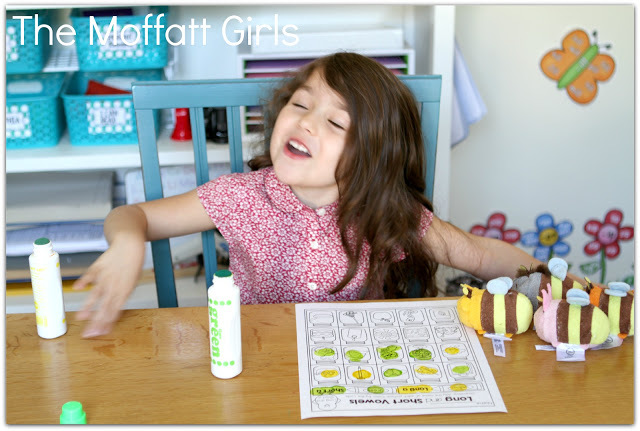 Use the built in manipulates (jellybeans) to help you solve the problems. 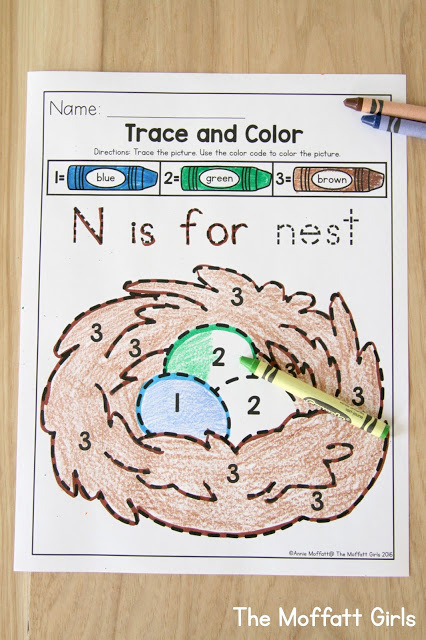 *Number Bonds I – Complete the number bonds by tracing the numbers on the eggs (part) and writing the sum (whole). 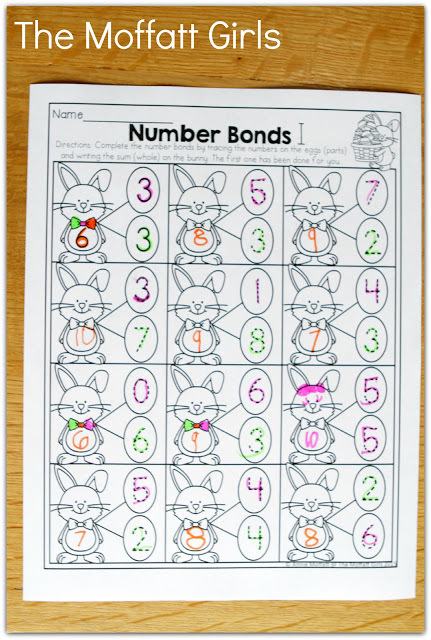 *Number Bonds II – Complete the number bonds by tracing the numbers on the eggs (part) and bunny (whole) and filling in the missing part. 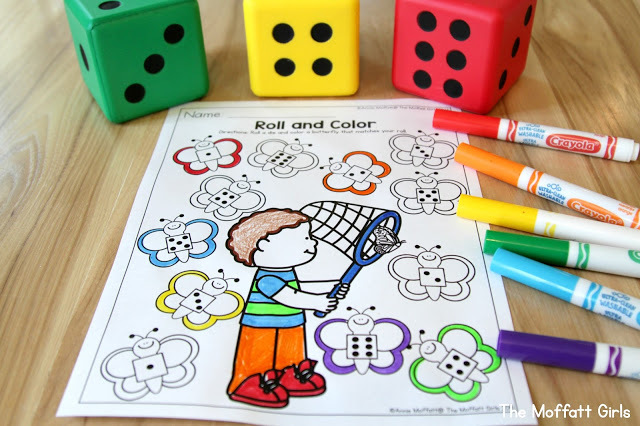 *Roll, Trace and Solve to 10!- Roll a die. Trace and solve an addition problem in that column. 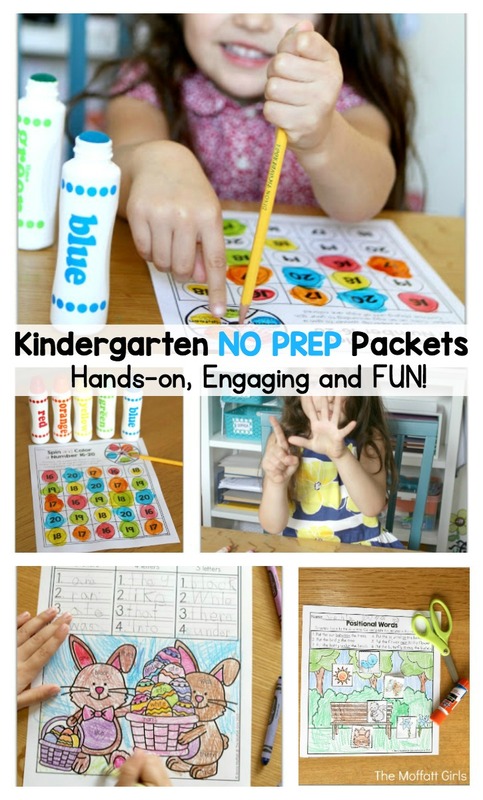 Cut out the built in manipulative to help you. *Subtraction with Dominos- Complete the number sentence for each set of dominos. 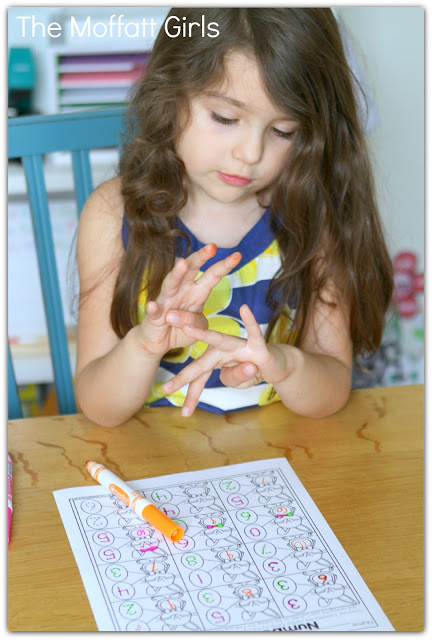 *Addition with Dominos- Complete the number sentence for each set of dominos. *Money: Pennies- Count the pennies in the jar. Cut and paste the correct amount. 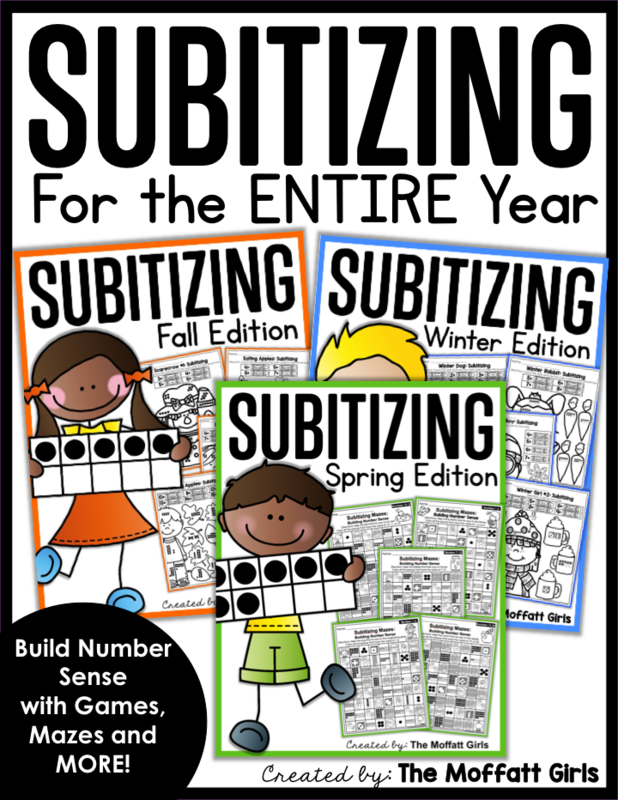 *I Can Subtract to 10- Solve the subtraction problems. Cut out the built in manipulatives (bugs) to help you. *I Can Count Backwards from 20- Trace the numbers as you go. Cut and paste the missing numbers from 20-1. 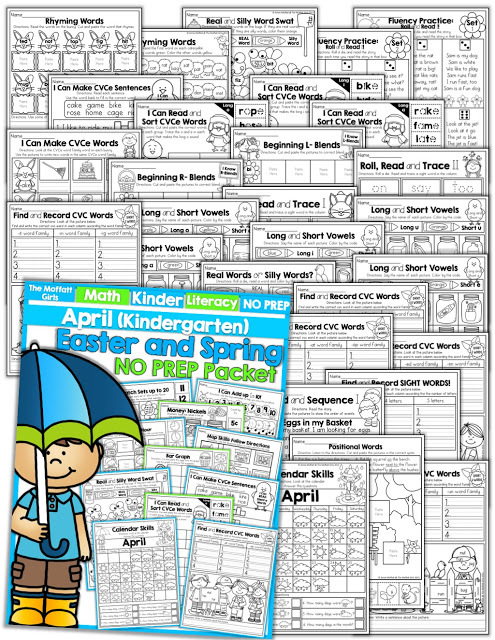 *I Can Add up to 10- Trace and complete the number sentences on the caterpillars. 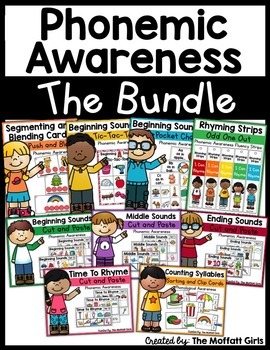 Use the long caterpillar to help you add. *I Can Match Sets up to 20- Count each set of dots on the flowers. 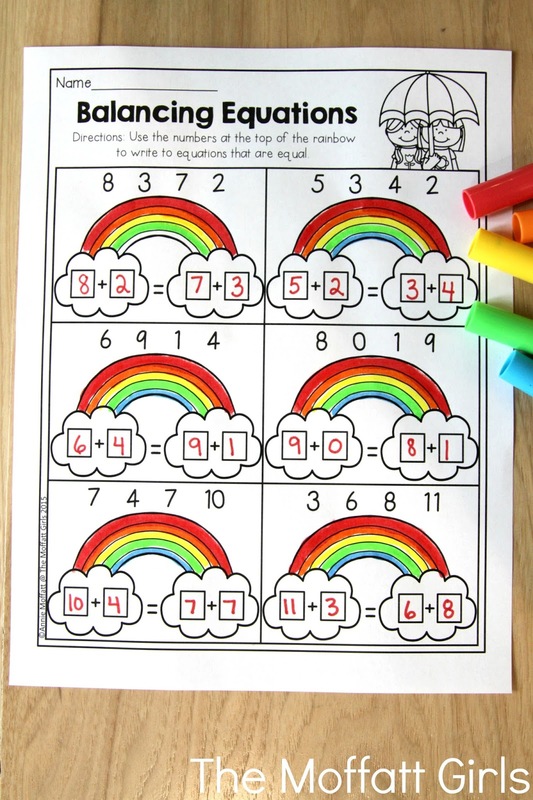 Cut and paste the number that matches (11-20). 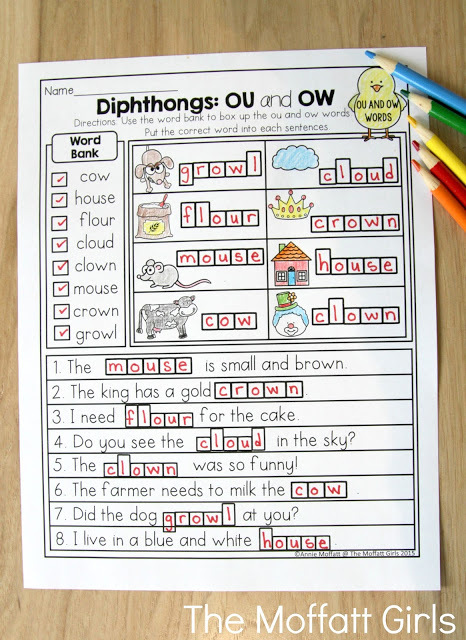 *Diphthongs: ou and ow- Use the word bank to box up the words. 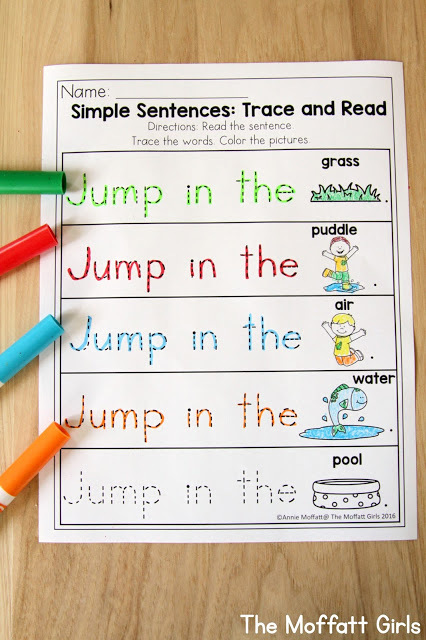 Use the words in the sentences. *Diphthongs: oi and oy- Use the word bank to box up the words. 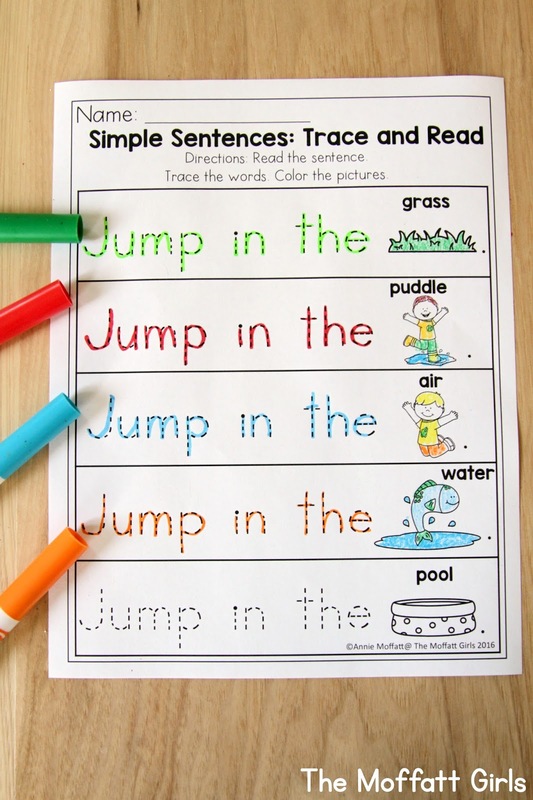 Use the words in the sentences. *R-Controlled Vowels- (ar and or) -Color the words by the color code. Use the word bank to box up the words. 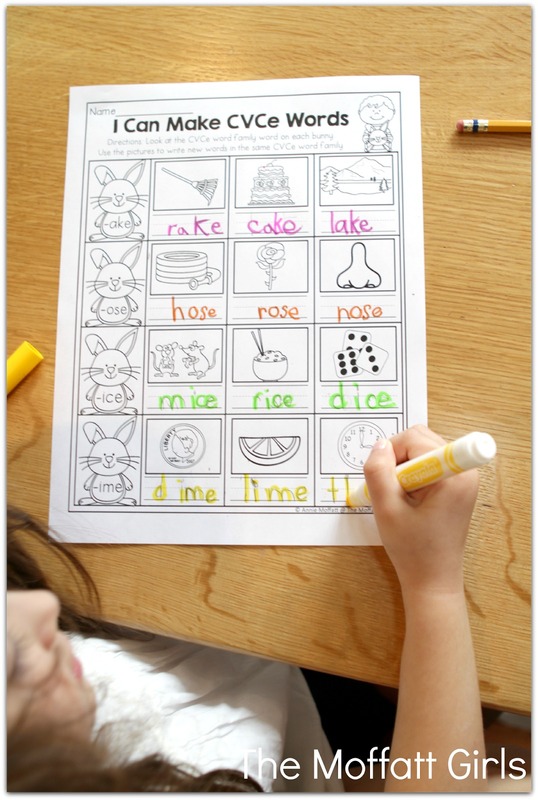 *R-Controlled Vowels- (er and ir) -Color the words by the color code. Use the word bank to box up the words. 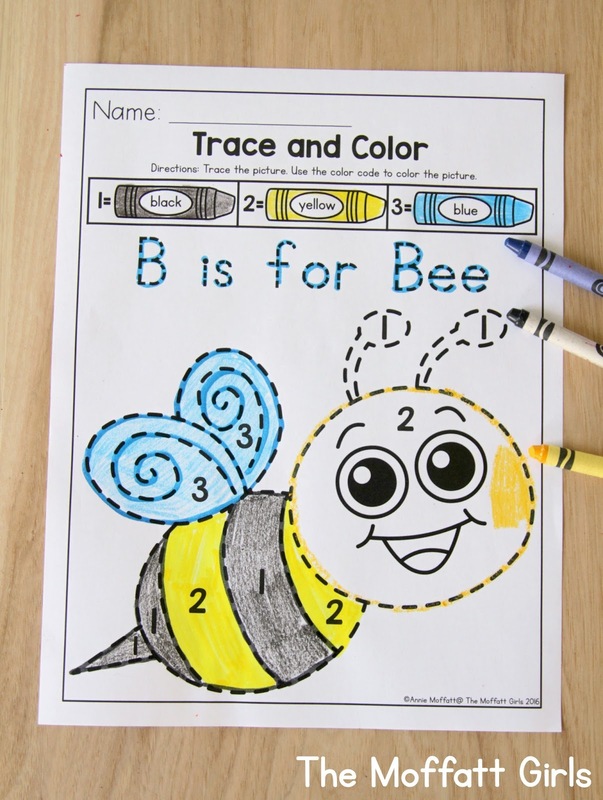 *”OO” Sounds- Color the words by the color code. Use the word bank to box up the words. 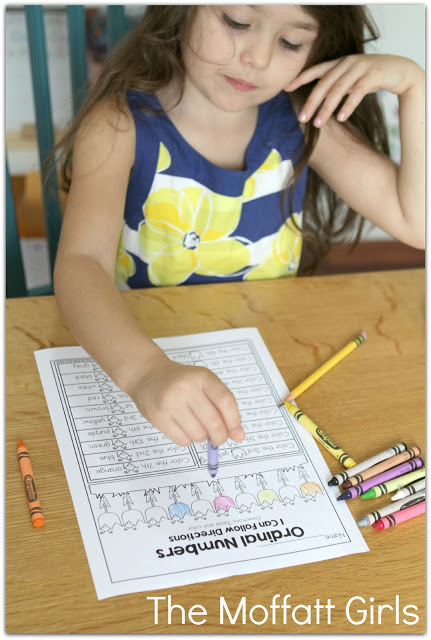 *Compound Words I- Use a word from each word bank to make a compound word. 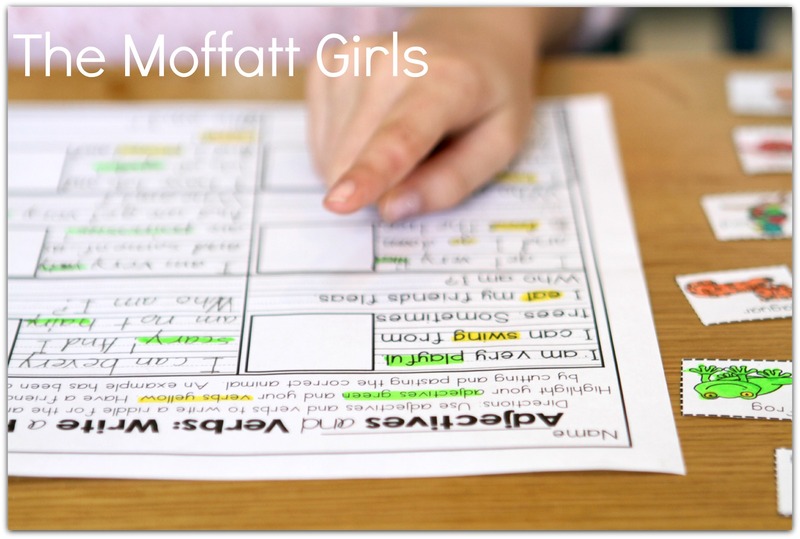 Write the words in the boxes. 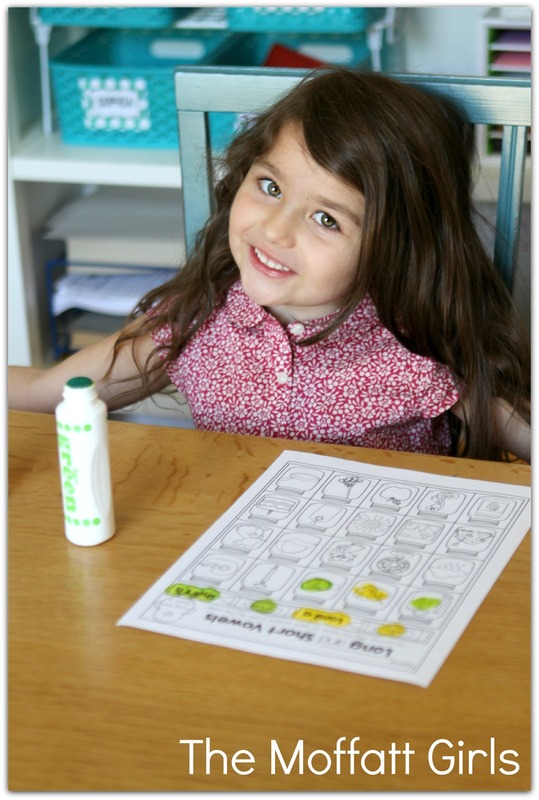 *Compound Words II- Use a word from each word bank to make a compound word. Write the words in the boxes. 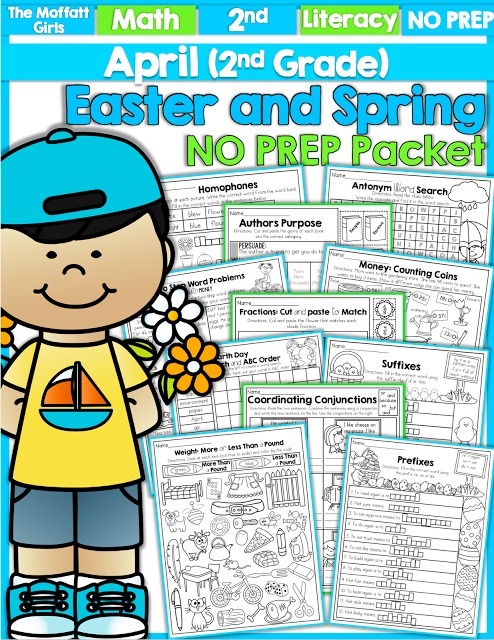 *Nouns- Use the nouns in the word bank to complete the sentences by boxes them up. 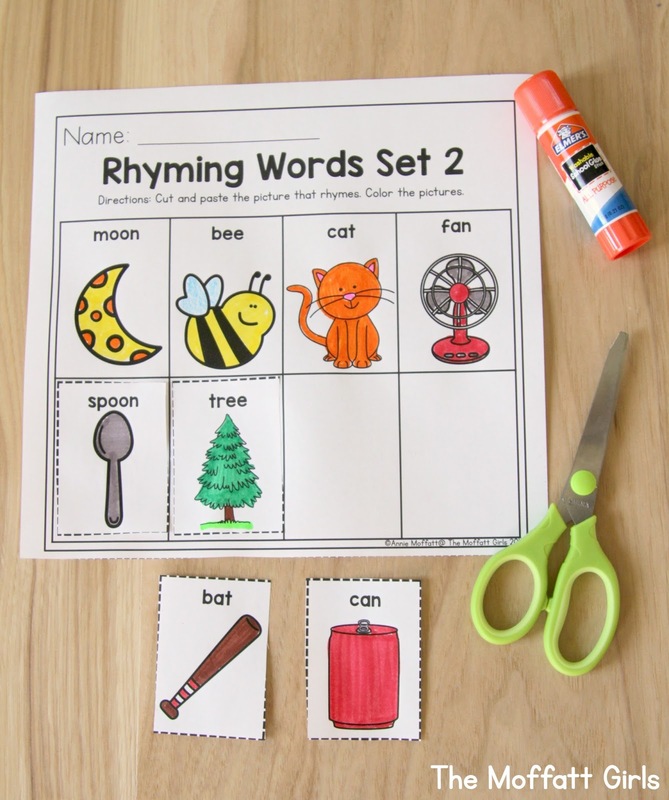 Sort the words by person, place or thing. *Spring Word Search- Find the spring words in the word search. 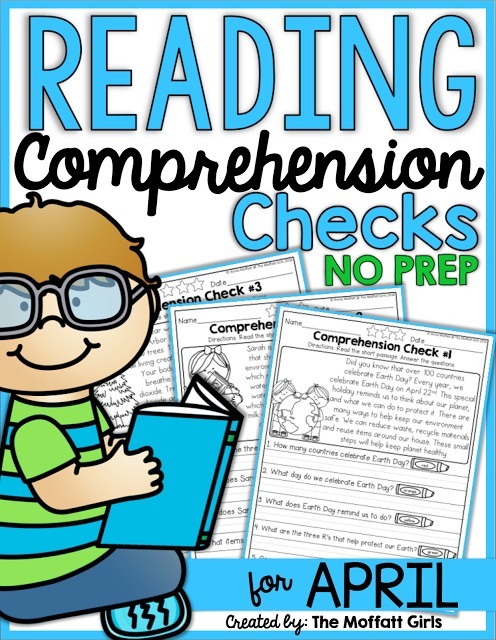 *Finding Information- Look at the titles of the three books. 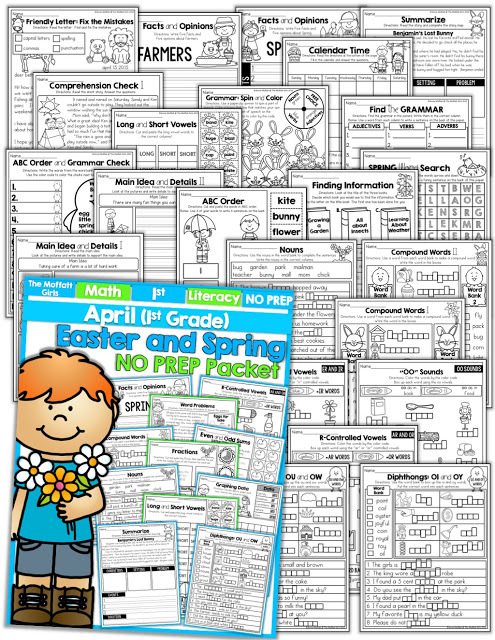 Decide which book you would use to find the different information. *ABC Order- Cut and paste the word in ABC order. 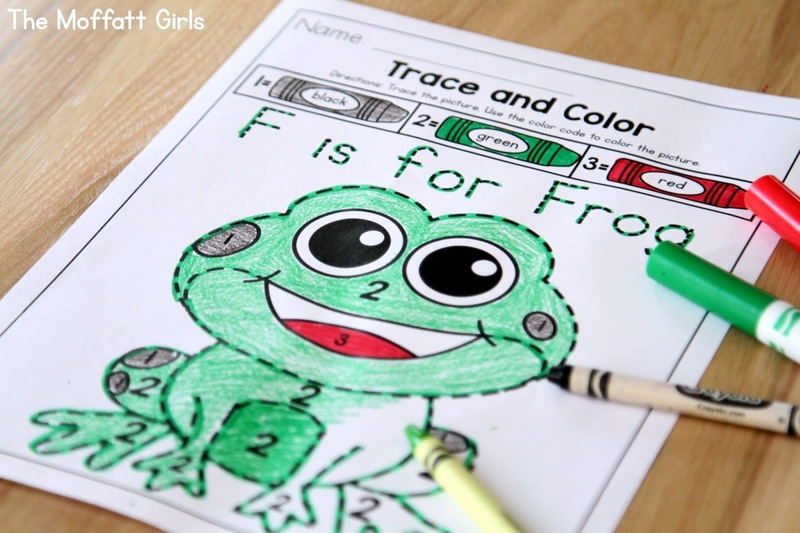 *ABC Order and Grammar Check- Write the words from the Word Bank in ABC order and then color the words according to their part of speech: nouns, verbs and adjectives. *Find the Grammar- Find the hidden grammar in the pictures. 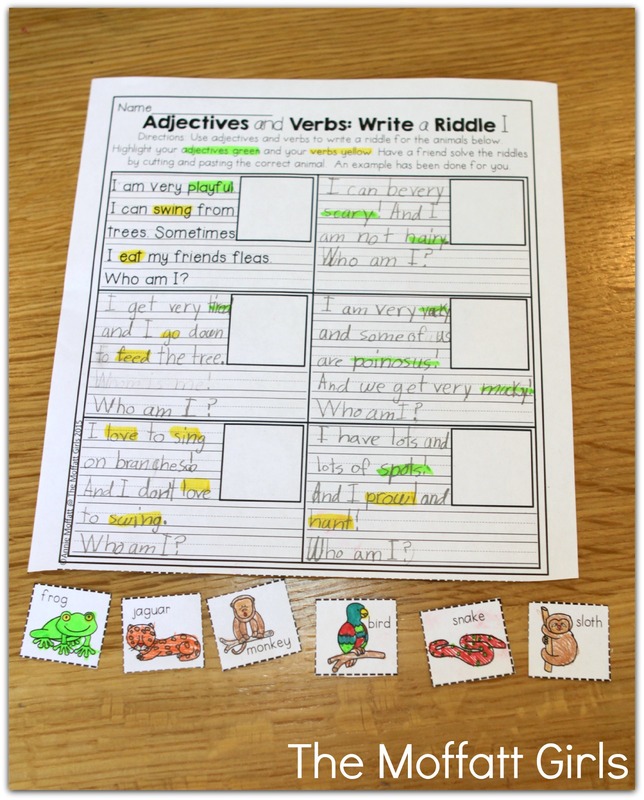 Write the part of speech in the correct columns: adjectives, verbs and adverbs. 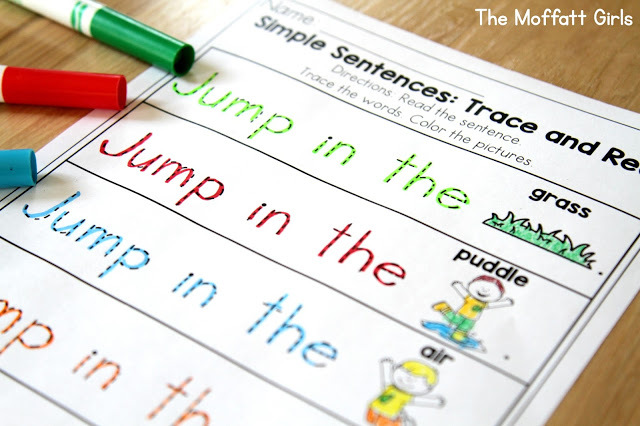 *Grammar Spin and Color: Spin a part of speech with a paper clip and pencil. Color the bunny that has that part of speech. 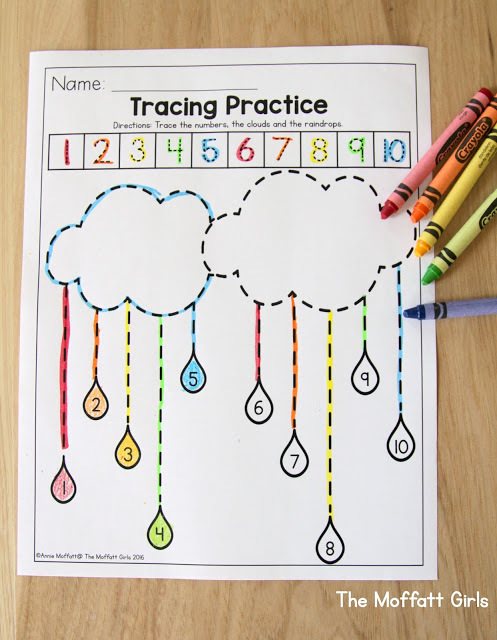 *Long and Short Vowels0 Read the words on the clouds and sort them to the correct spots. 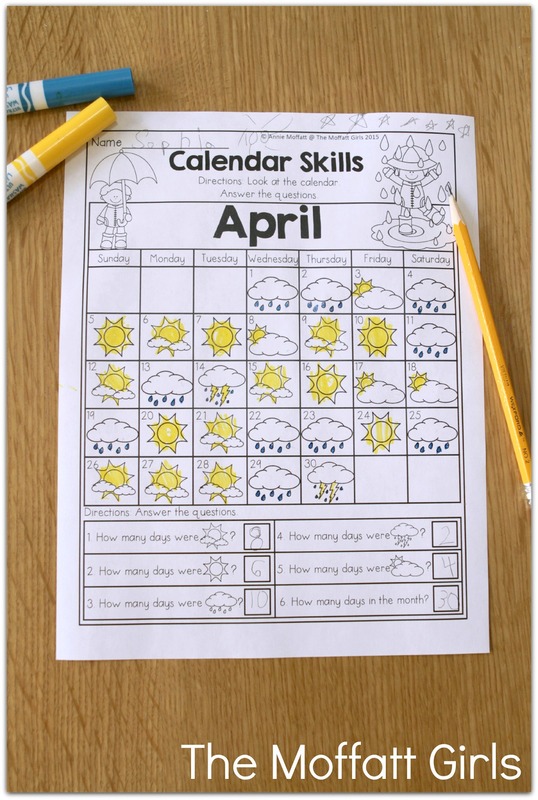 *Calendar Time- Fill in the April Calendar according to the directions. 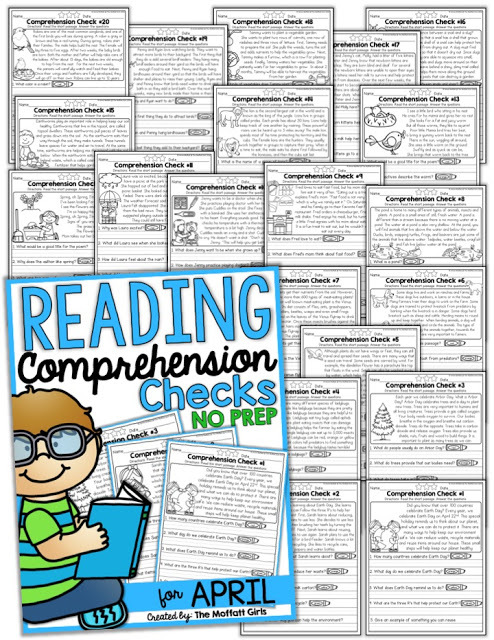 *Comprehension Check- Read the short stories and answer the questions. 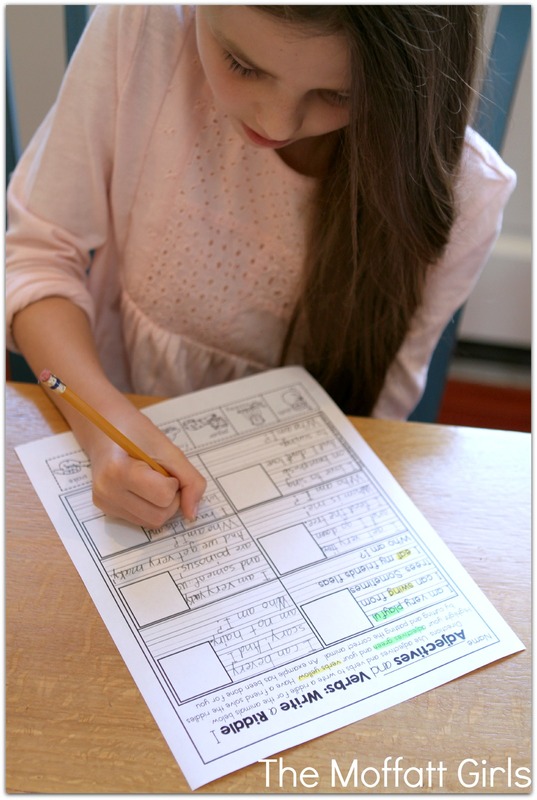 *Summarize- Read the story and complete the story map. *Facts and Opinions about Spring- Write 5 facts and 5 opinions about Spring. 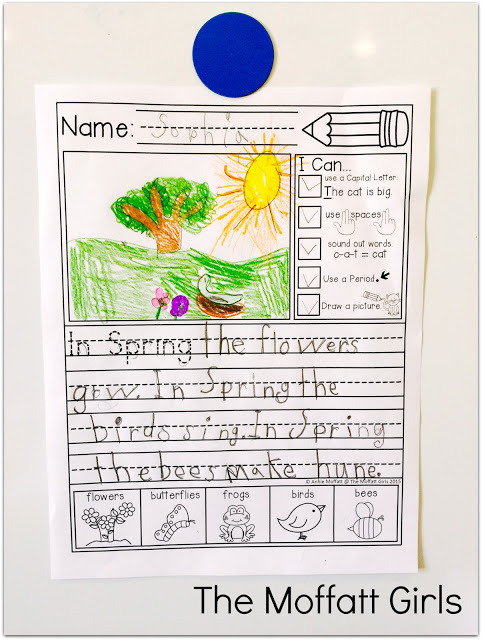 *Facts and Opinions about Spring- Write 5 facts and 5 opinions about Famers. *Main Idea and Details I- Read the main idea. Look at the pictures and write details to support the main idea. *Main Idea and Details II- Read the main idea. 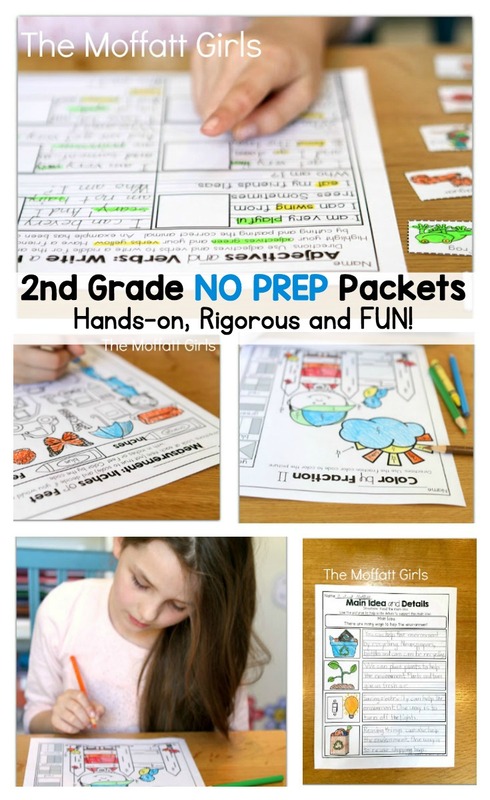 Look at the pictures and write details to support the main idea. 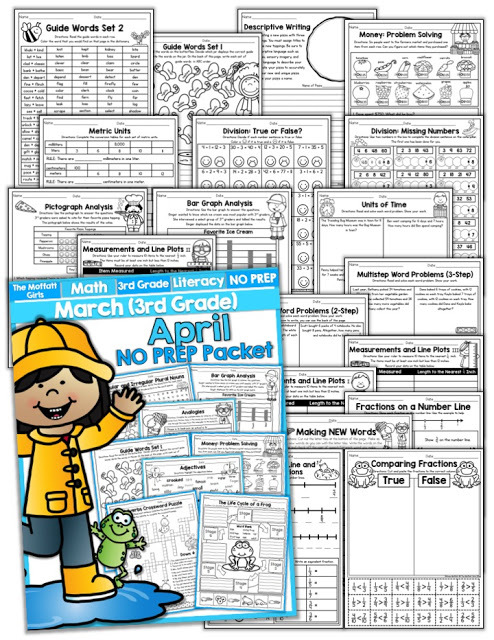 *Graphing Data- Use the data to graph each item. Answer the questions. 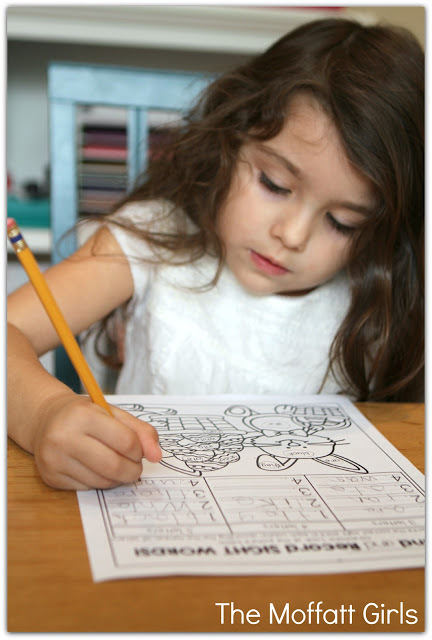 *Friendly Letter: Fix the Mistakes- Read the friendly letter and fix the mistakes. 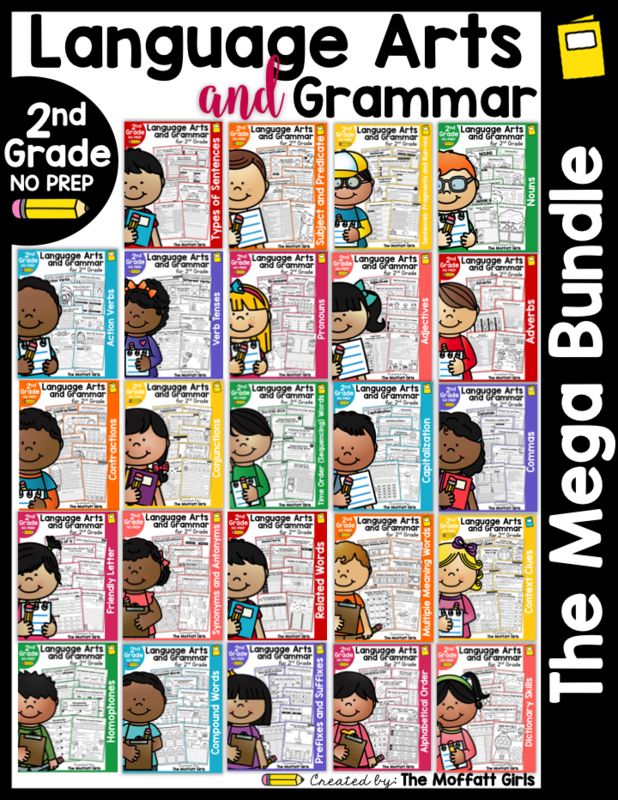 *Word Problems- use the price information to answer the questions. *Roll, Add and Color (Adding 3 Addends)- Roll 3 dice, add the numbers and color the picture. *Adding to 20- Use the bug ket to solve the addition problems. 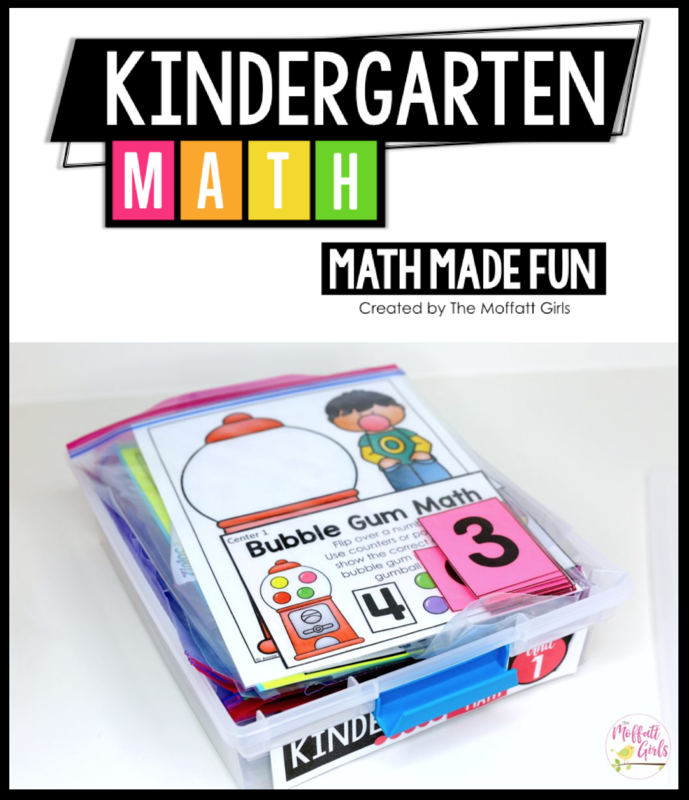 *Missing Addends- Go around the square (add or subtract according to the sign) and write the missing addends. 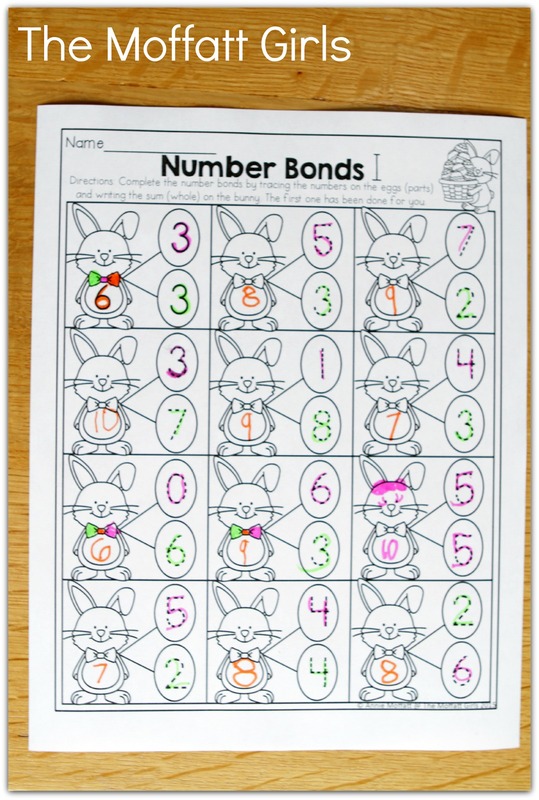 *Number Bonds- Complete each number bond. *Fractions- Cut and paste the flower that matches the number word. 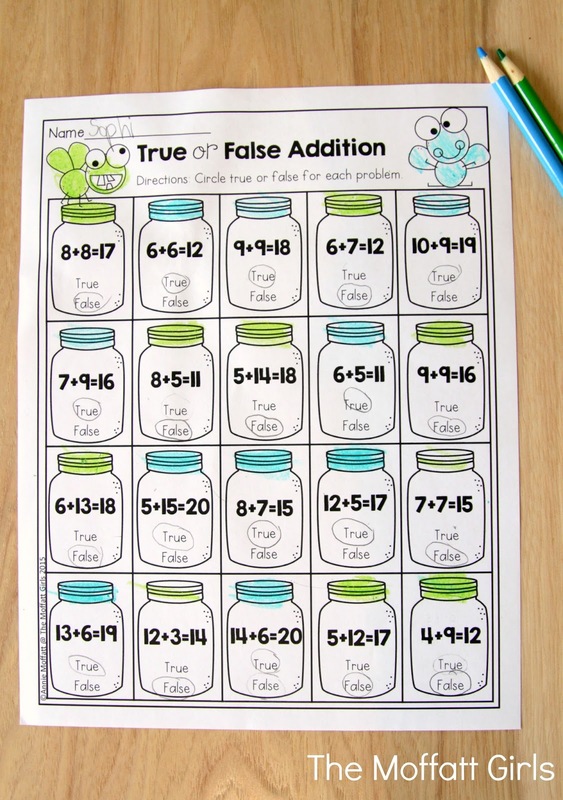 *True or False Addition- Decide if the problems are true or false. Circle the correct answer. *Time to the Half Hour- Draw hands to show the correct time. 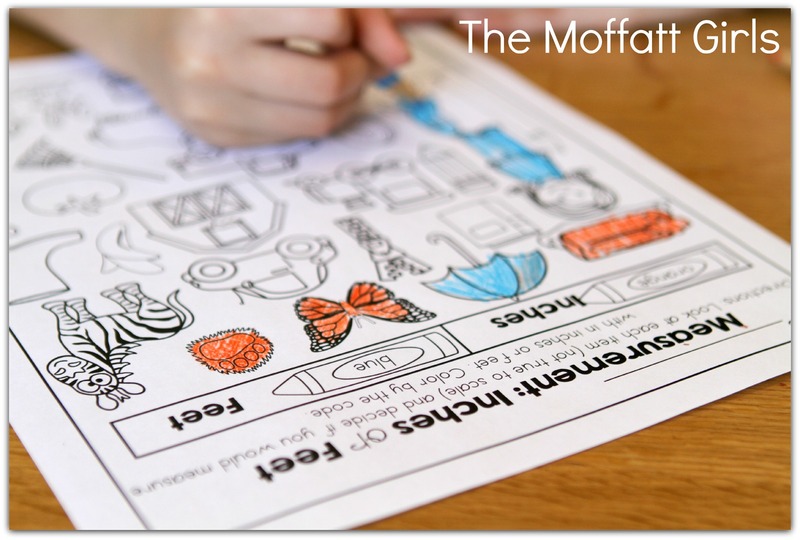 *Time to the Half Hour II – Draw hands to show the correct time. *Time to the Hour- Draw hands to show the correct time. 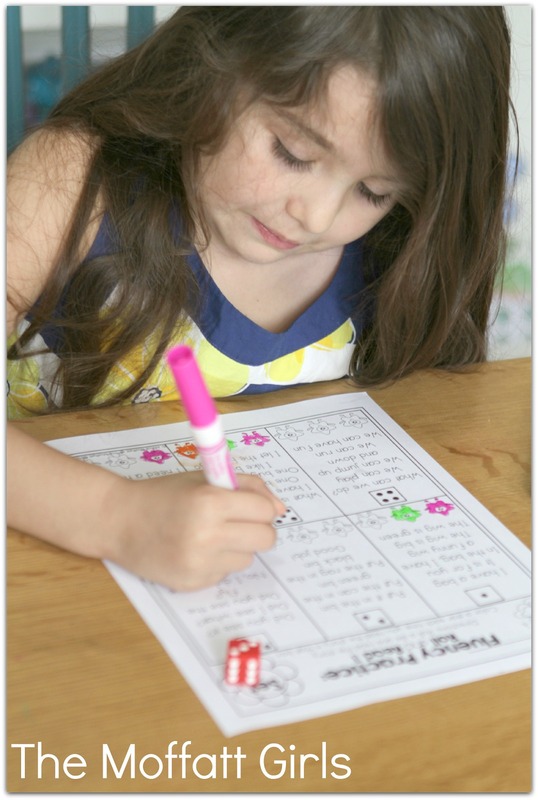 *Double Digit Domino Addition (No Regrouping)-fill in the missing dots on the dominos to make the sums true. 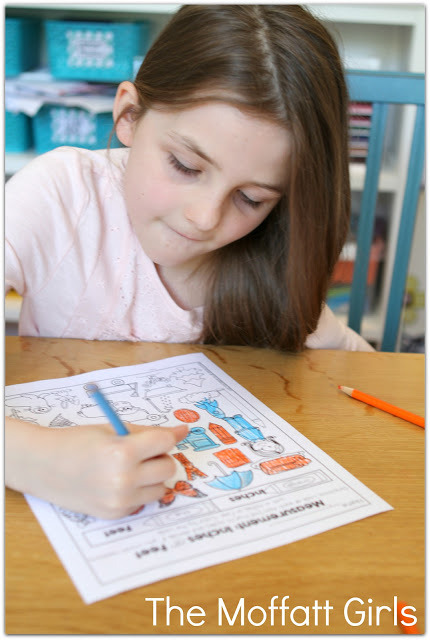 *Double Digit Addition (No Regrouping) – Solve the problems. 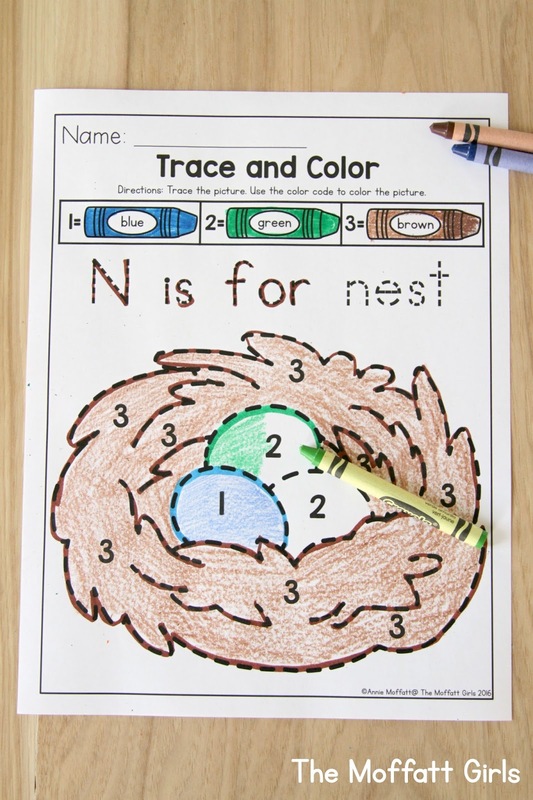 Color an egg that matches the sum. 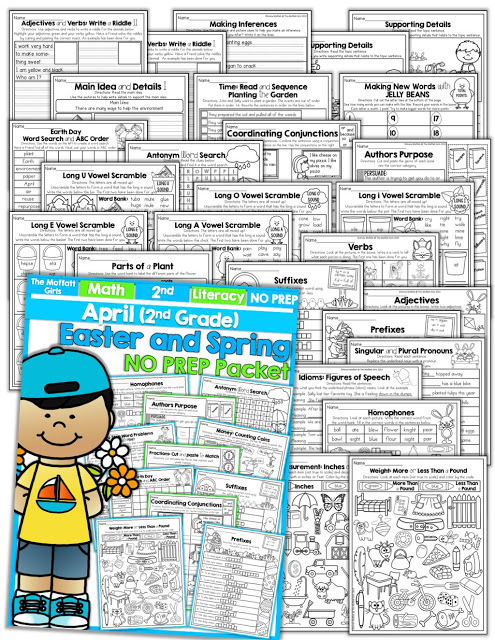 *Double Digit Addition (No Regrouping)- Solve the math problems on the nest. Cut and paste a bird that matches (even or odd). 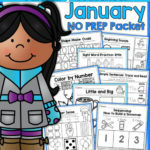 Money: Counting Coins- Look at the price of the item. Color the coins needed to buy the item. Write how much change is left over. *Shape Attributes- Look at the shape and answer the questions. 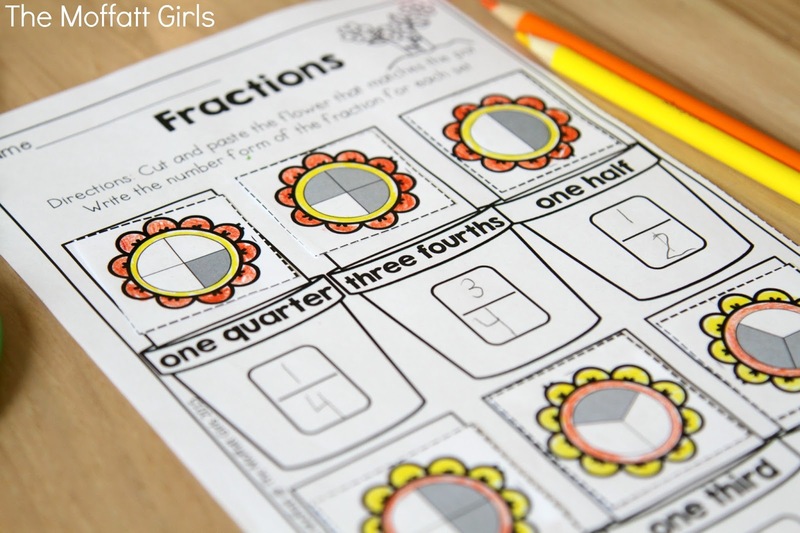 Divide the shape into the give fraction. 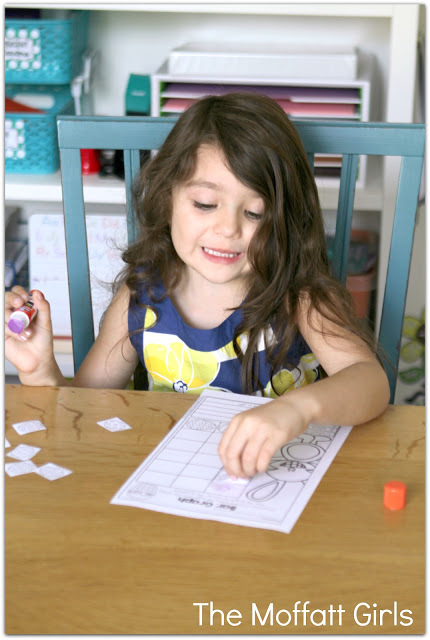 *2-D Shapes (Adding 3 Addends) – Look at each set of shapes. 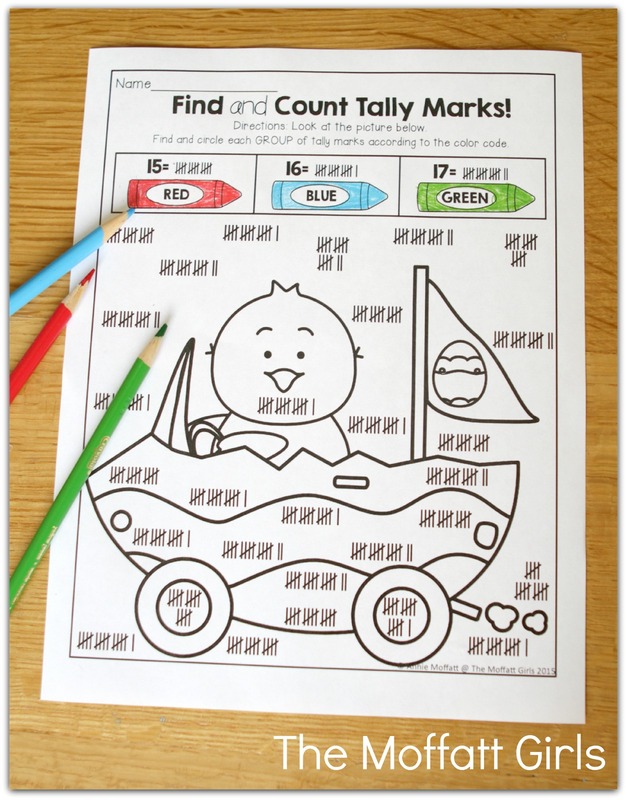 Use the key to add up how much each shape is worth. *1 More, 10 More, 1 Less, 10 Less- Read the number word in the middle. 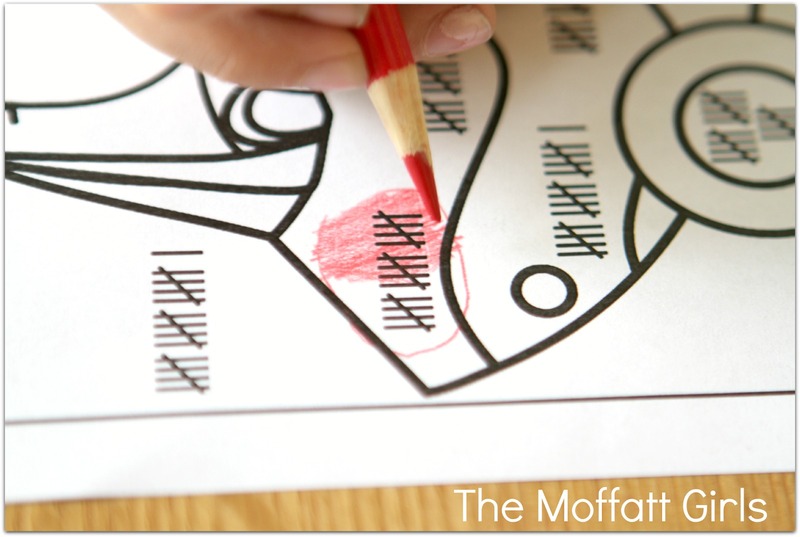 Write 1 more, 10 more, 1 less and 10 less for each number. 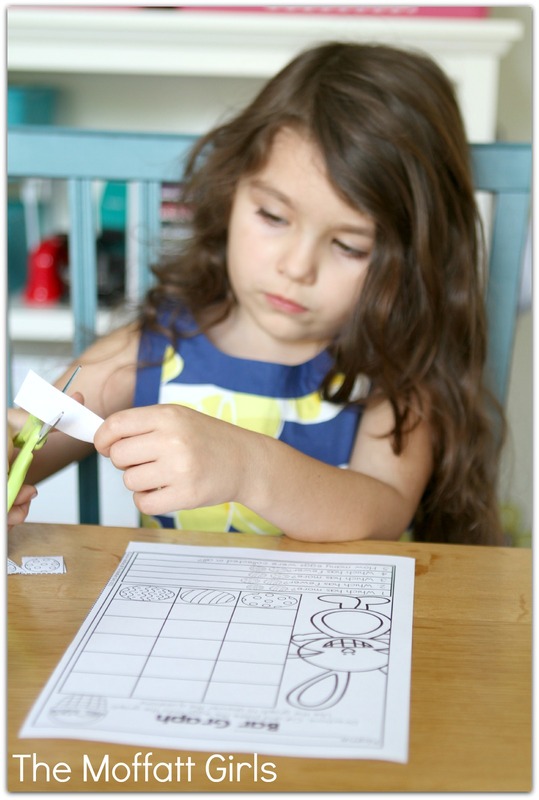 *Balancing Equations- Use the numbers to write 2 sets of equations that are equal. *Addition to 20 Set 1- Solve the problems. 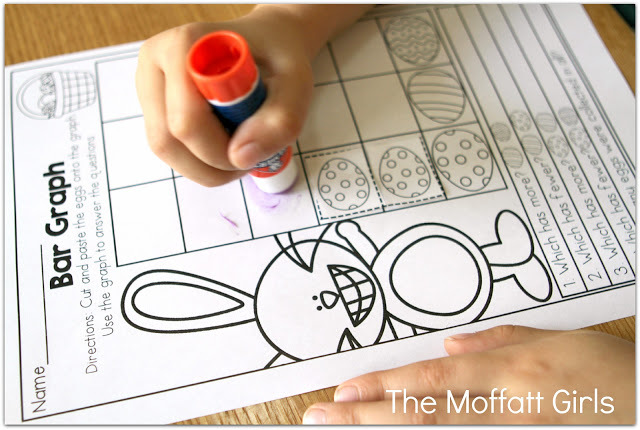 Cut and paste the answer to the correct bunny. *Addition to 20 Set 2- Solve the problems. Cut and paste the answer to the correct chick. 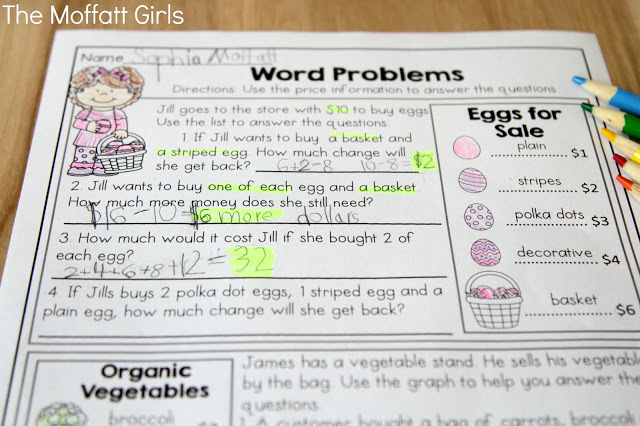 *Word Problems with an Unknown Addend- Solve the word problems and show your work. *Parts of a Plant- Use the word bank to label different parts of the flower. 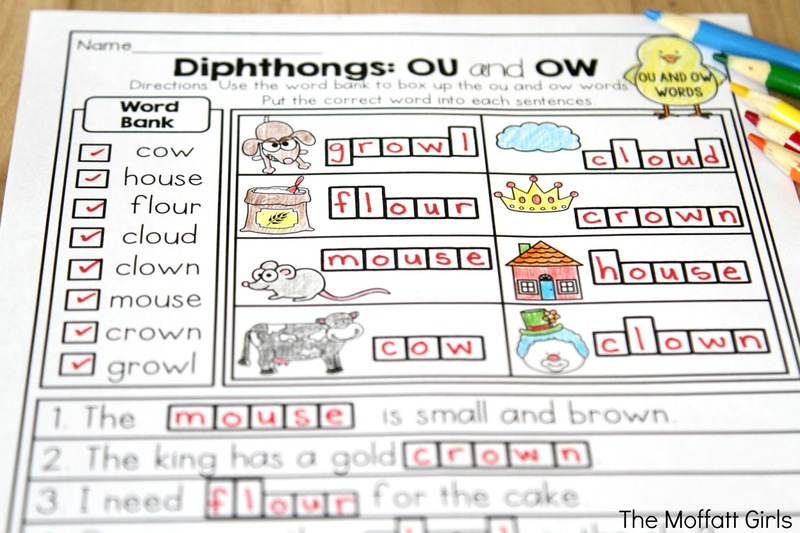 *Homophones: Use the word bank to write the correct homophone. 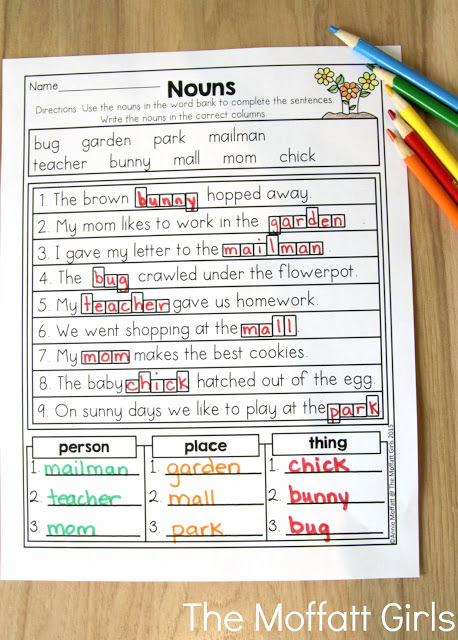 Fill in the sentences with the correct words. *Idioms: Figures of Speech- Write what you think the underlined idiom means. *Singular and Plural Pronouns- Read each sentence, replace the noun with the correct pronoun. 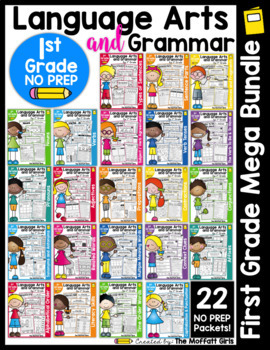 *Prefixes: Fill in the correct word using the prefix re, un or dis. 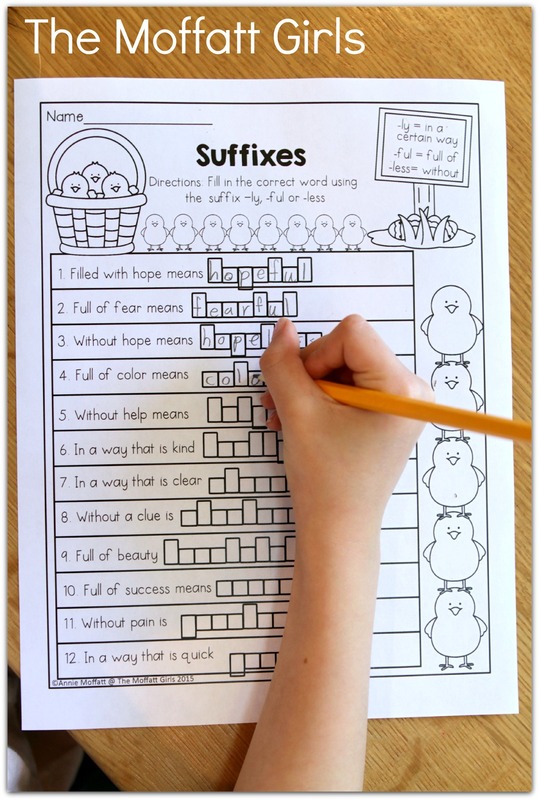 *Suffixes: Fill in the correct word using the suffix -ly, -ful or -less. 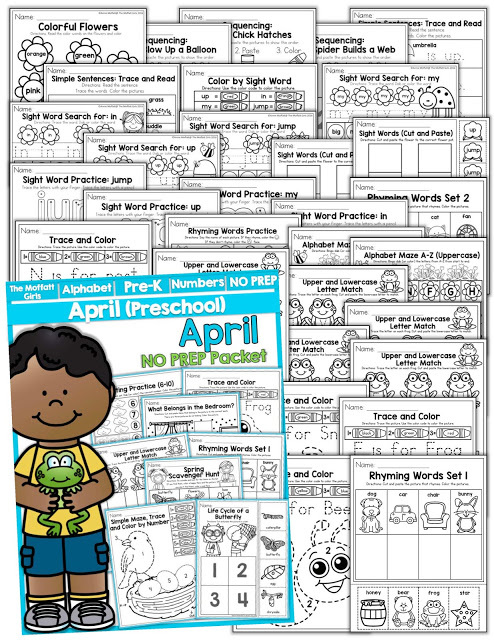 *Adjectives: Look at the picture in the boxes and write two adjectives that could describe each picture. 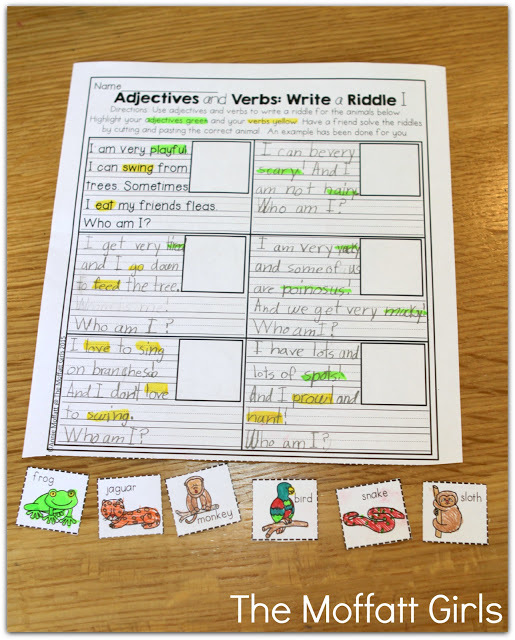 *Verbs: Look at the picture in the boxes and write a verb that tells what the person is doing. *Long a Vowel Scramble: Use the words in the word bank to unscramble the words. Write the correct word under each chick. 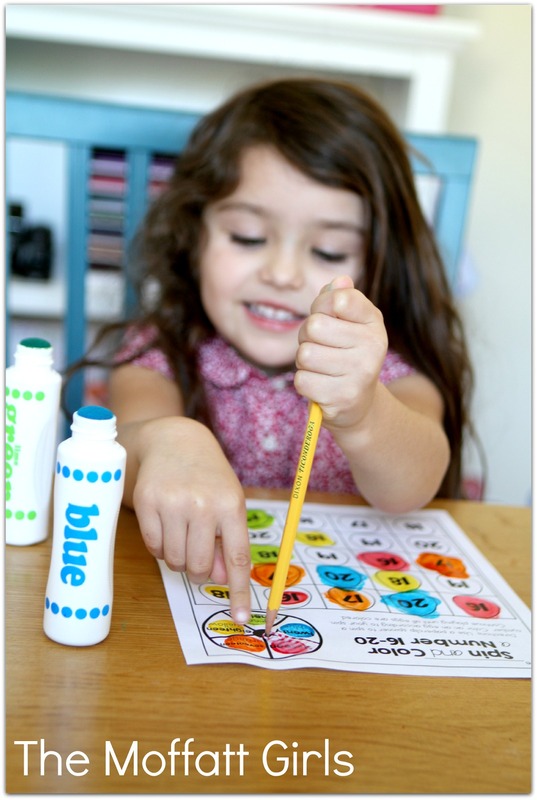 *Long e Vowel Scramble: Use the words in the word bank to unscramble the words. 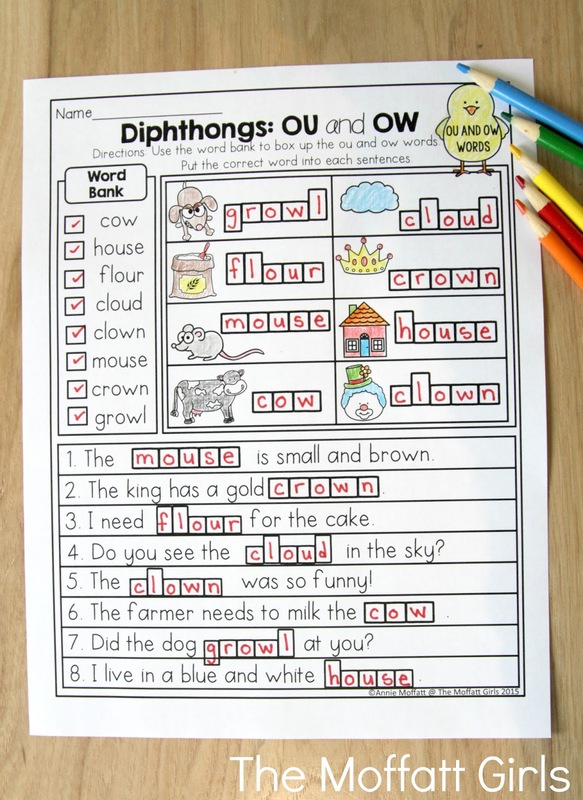 Write the correct word under each basket. 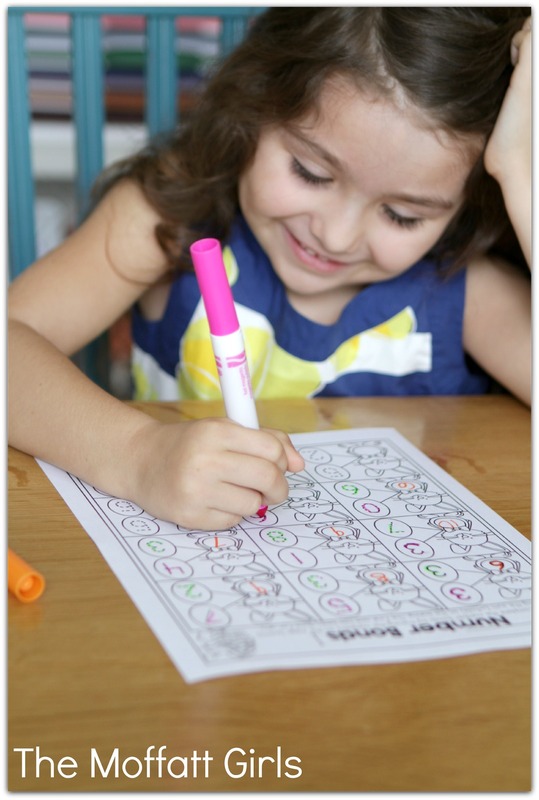 *Long a Vowel Scramble: Use the words in the word bank to unscramble the words. 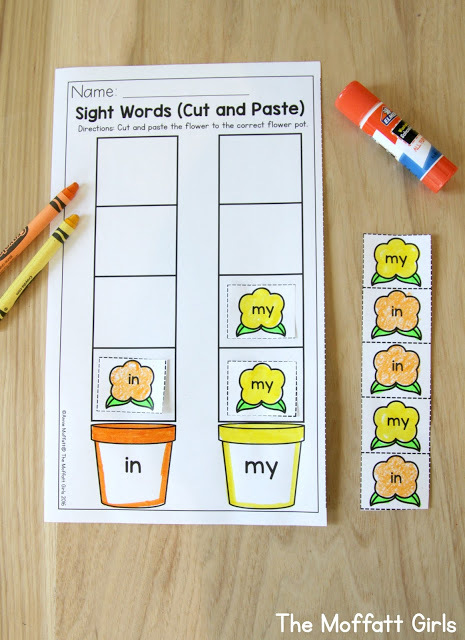 Write the correct word under each pot. 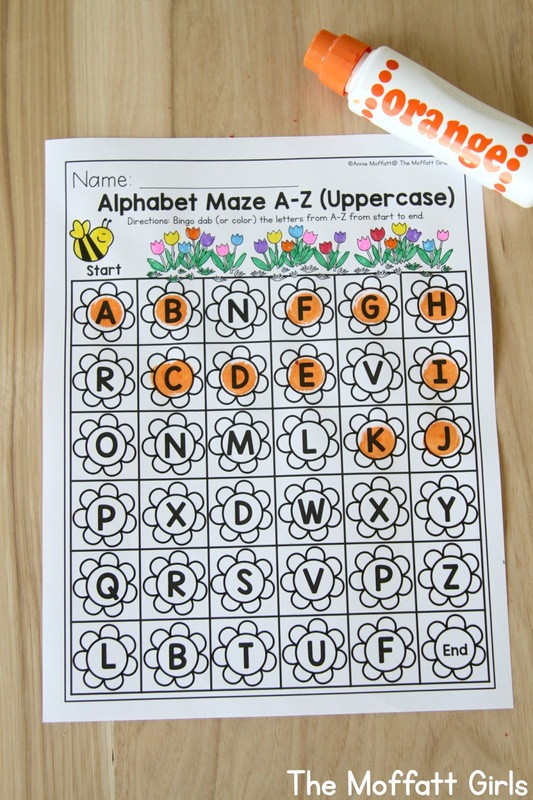 *Long a Vowel Scramble: Use the words in the word bank to unscramble the words. 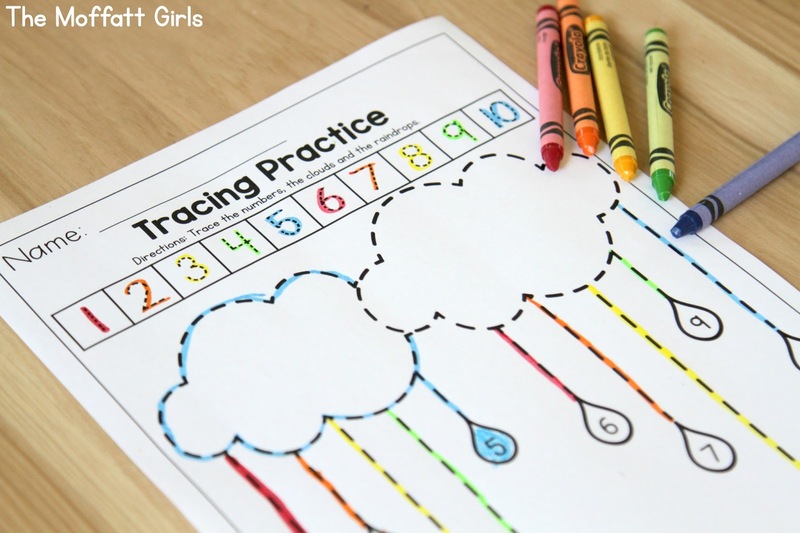 Write the correct word under each cloud. 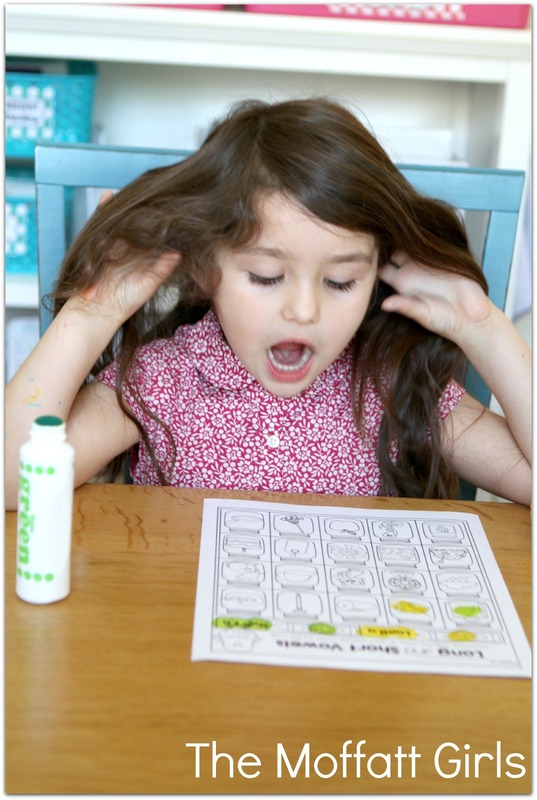 *Long a Vowel Scramble: Use the words in the word bank to unscramble the words. Write the correct word under each recycling sign. 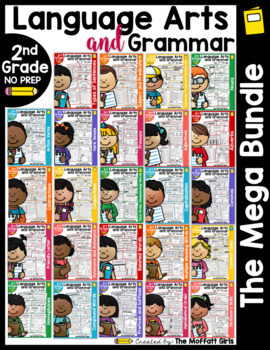 *Author’s Purpose- Cut and paste the genre of each book to the correct category. *Coordinating Conjunctions: Read the two sentences and combine them using the correct conjunction. *Antonym Word Search- Read the clues below. 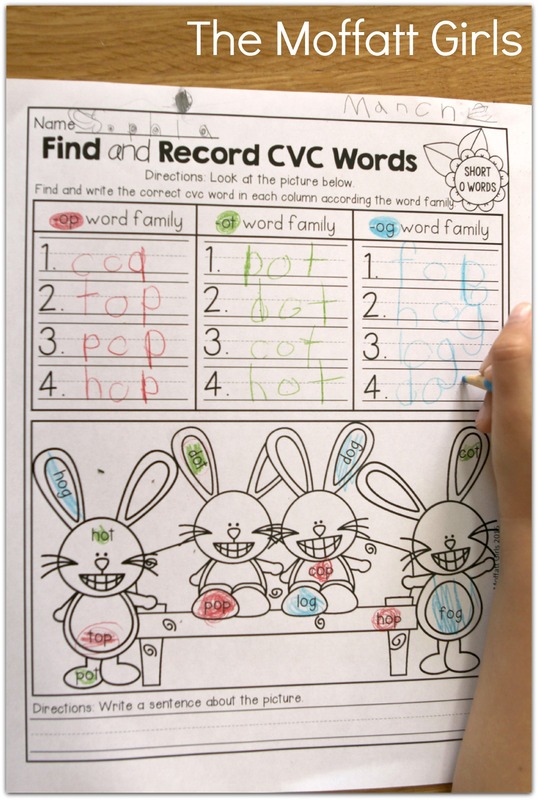 Write the opposite and find the word in the word search. 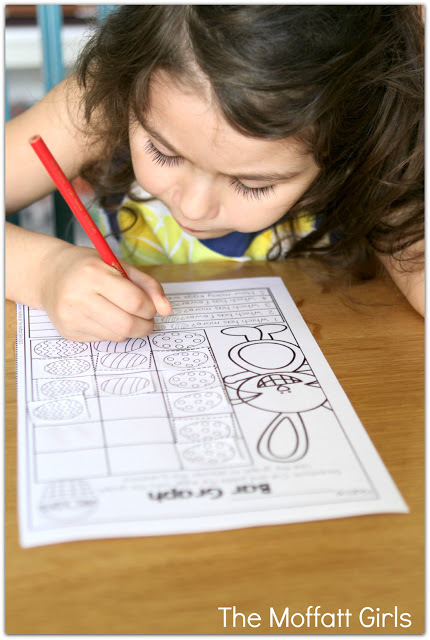 *Earth Day Word Search and ABC Order- Use the words in the word bank to create your own word search. 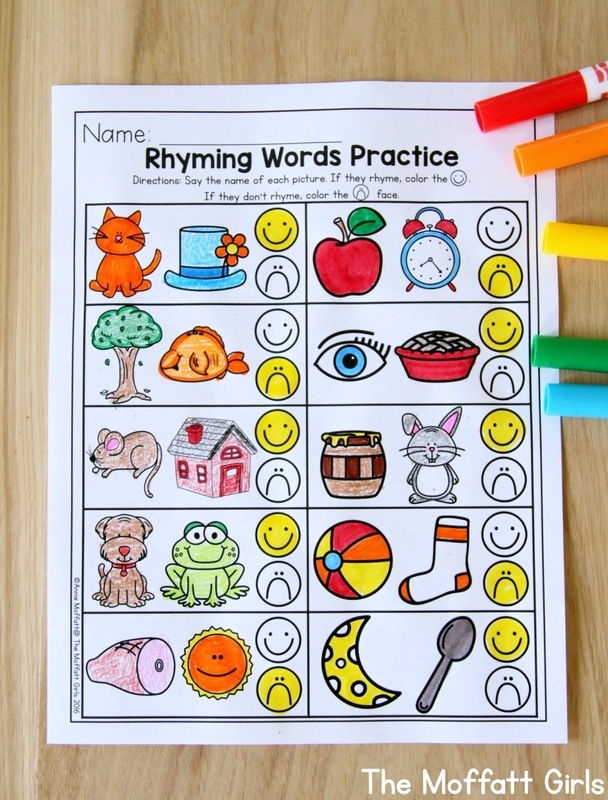 Have a friend find the words. 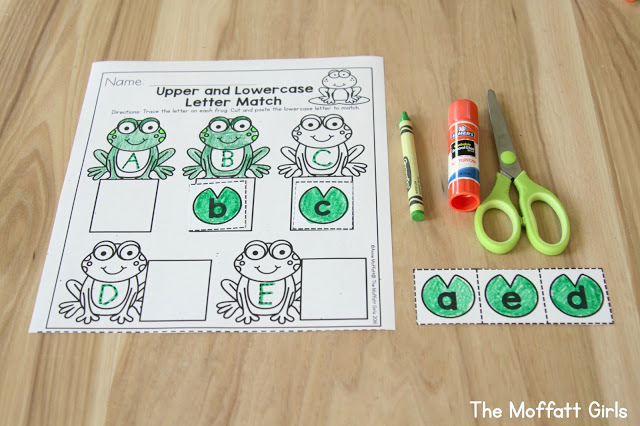 Write the words in ABC order. 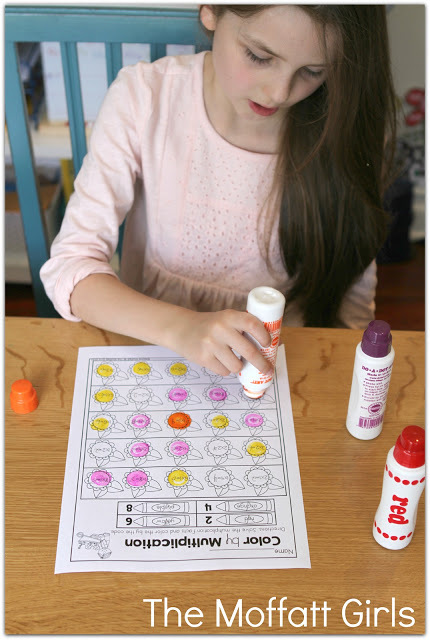 *Making New Words With Jelly Beans- Cut out the letter tiles at the bottom of the page. 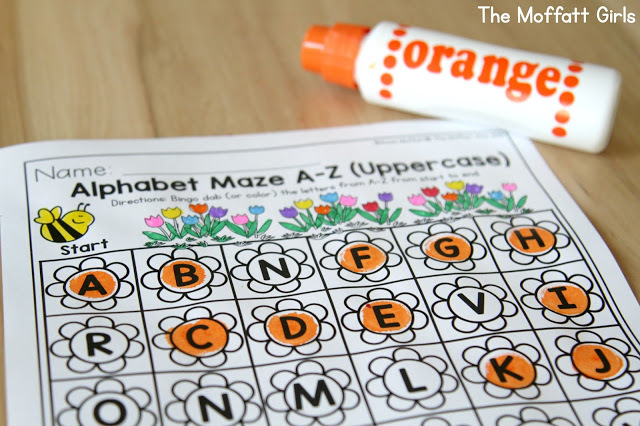 Use the tiles to make as many words as you can. 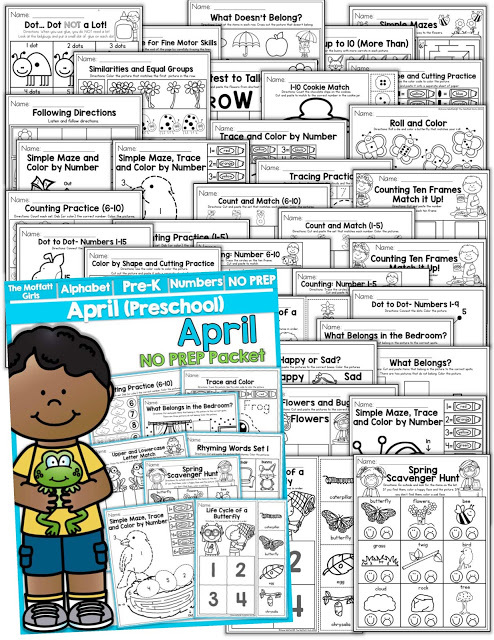 *Time: Read and Sequence- Planting a Garden- The events are out of order. 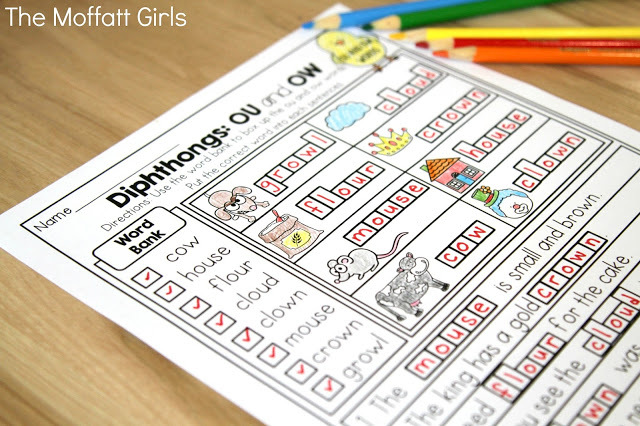 Put them in order 1-6 and rewrite the sentences on the lines below. 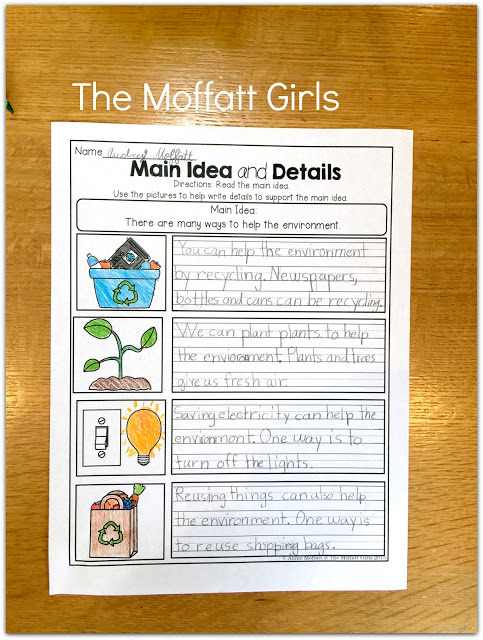 *Main Idea and Details I- Read the Main Idea: There are many ways to help the environment. Use the picture to help write supporting deals. *Supporting Details I- Read the topic sentence. 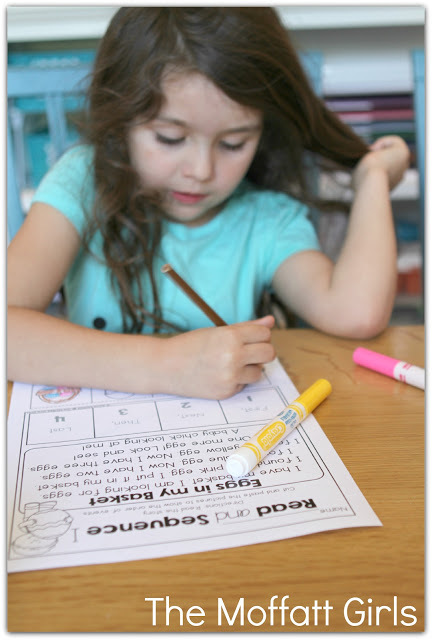 Use the pictures to help you write supporting details that relate to the topic sentence. (Planting and tending to a garden can be a lot of work). *Supporting Details II- Read the topic sentence. Use the pictures to help you write supporting details that relate to the topic sentence. 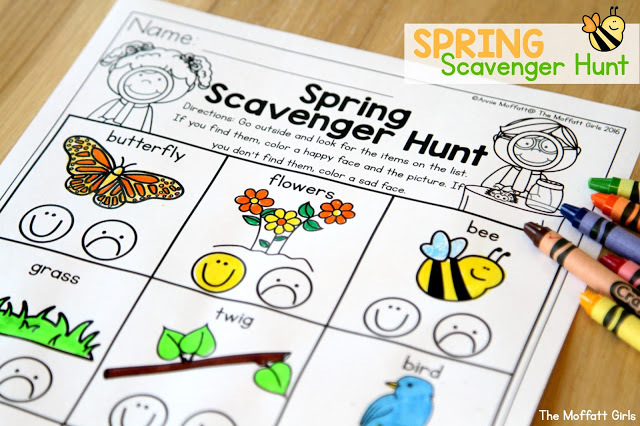 (There are many fun things to do in spring). 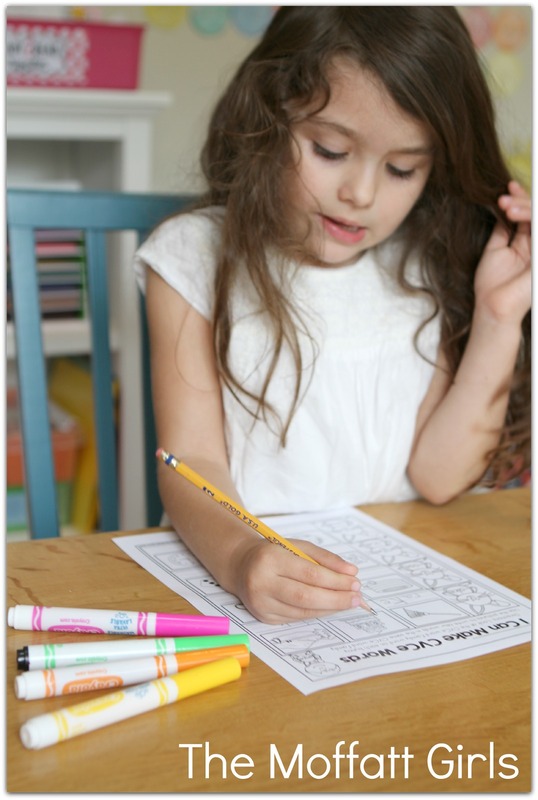 *Making Inference: Use the sentences and picture clues to help you make an inference. 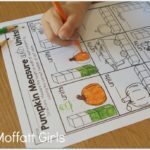 What can you infer? 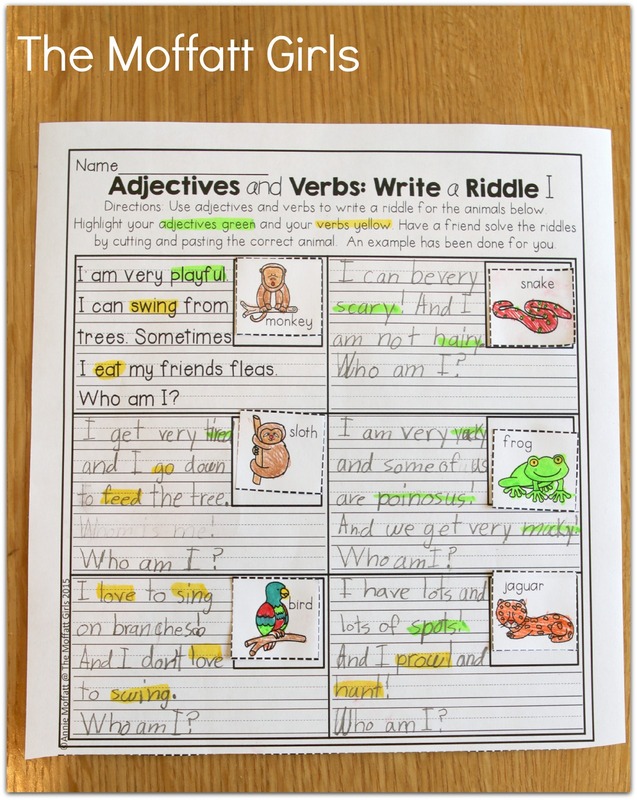 *Adjectives and Verbs: Write a Riddle I- Use adjectives and verbs to write a riddle for the animals below. Have a friend cut and paste the correct pictures to your riddles. 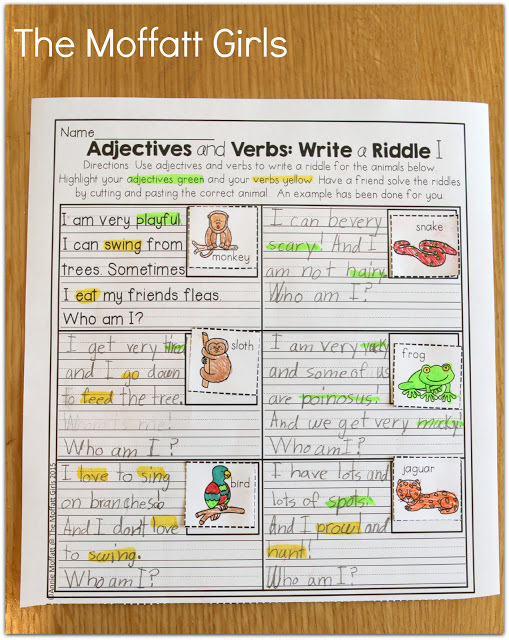 *Adjectives and Verbs: Write a Riddle II- Use adjectives and verbs to write a riddle for the insects below. 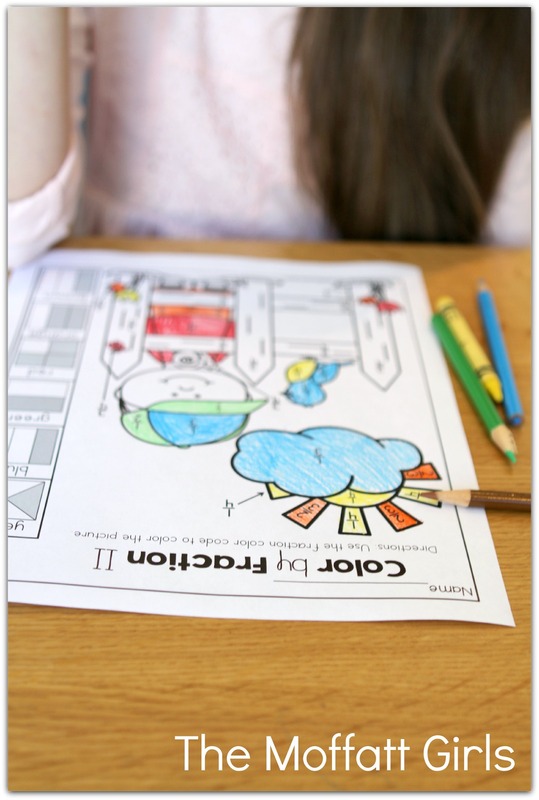 Have a friend cut and paste the correct pictures to your riddles. *Weight: More or Less than a Pound? 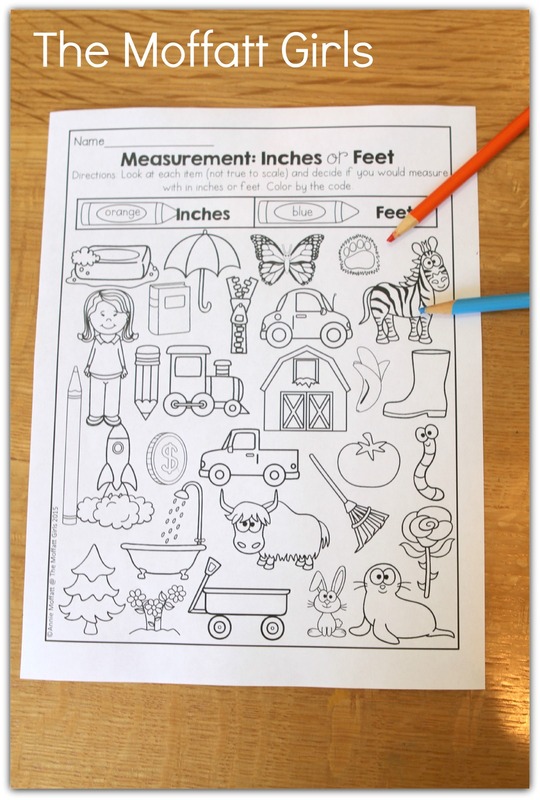 Decide if the items weigh more or less than a pound. Color by the color code. *Measurement: Inches or Feet? Decide if you would measure each item by inches or feet. Color by the color code. 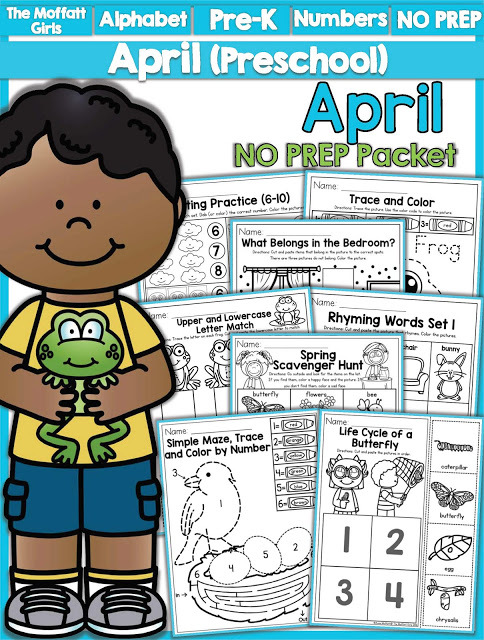 *Time: Read and Sequence- Daily Schedule- Look at the events of the daily routine. 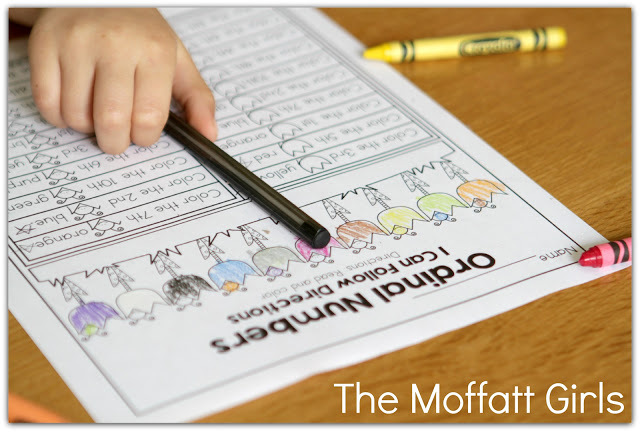 Put them in correct order by writing the routine next to the most logical time. *Arrays for Multiplication I- Circle equal groups for each set. 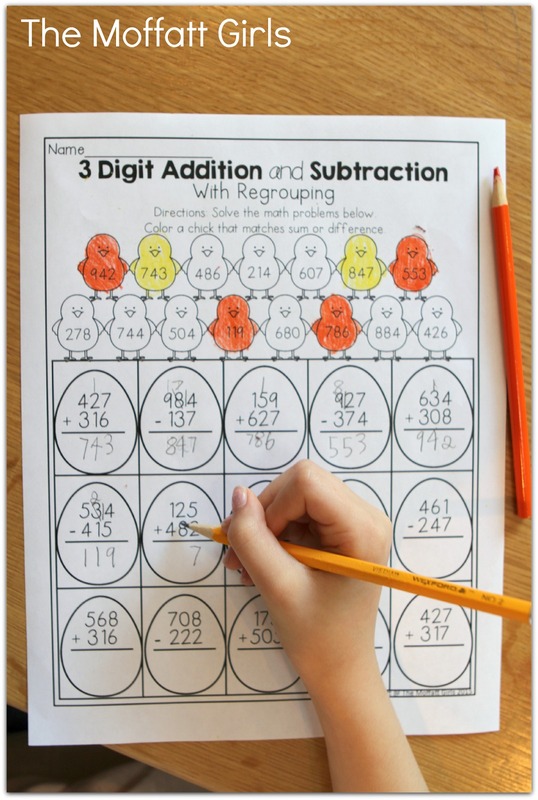 Write the repeated addition and multiplication problem. 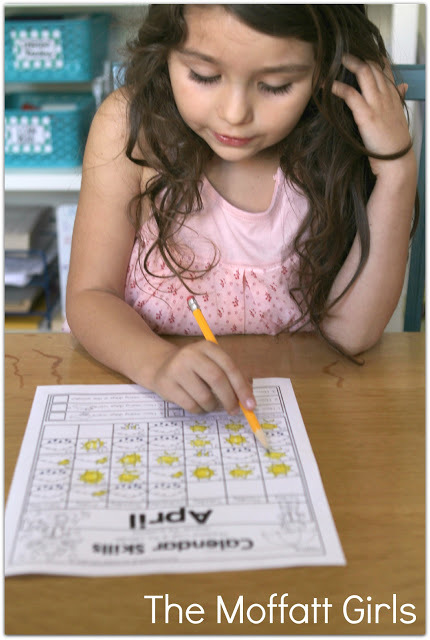 *Arrays for Multiplication II- Draw dots to show the multiplication problem. 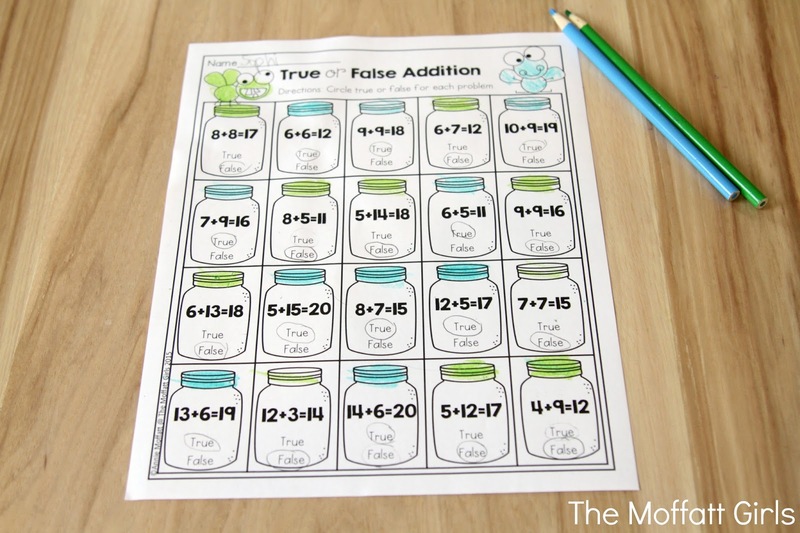 Write the addition and multiplication problem for each set. 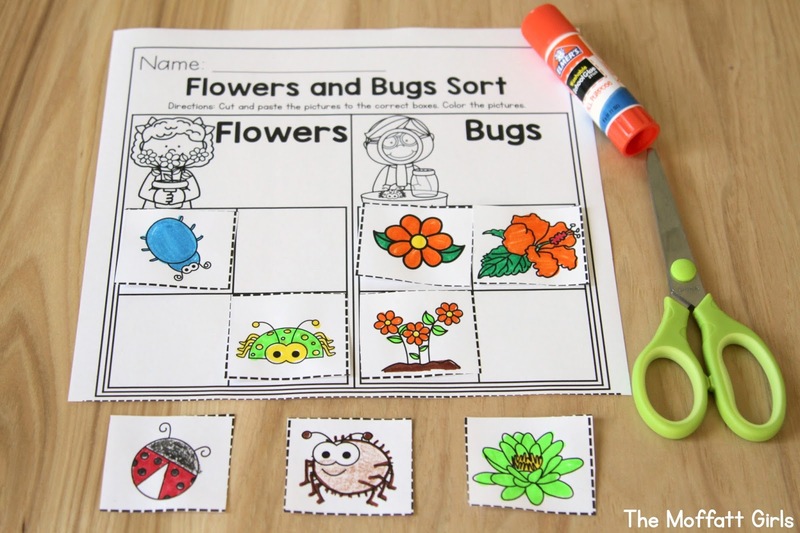 * Arrays: Cut and Paste to Match- Cut and pete the flower the matches the correct array. 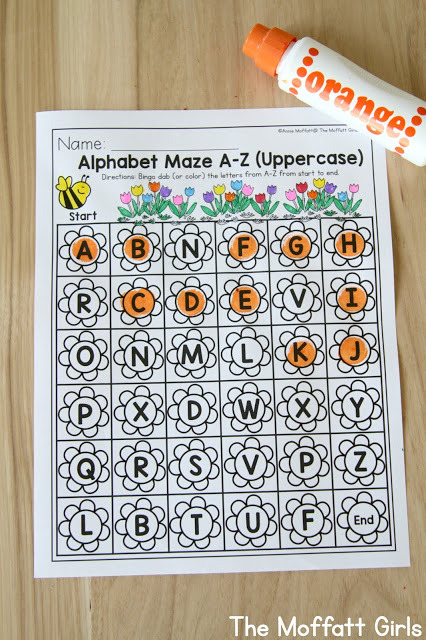 Write the product on the flower. 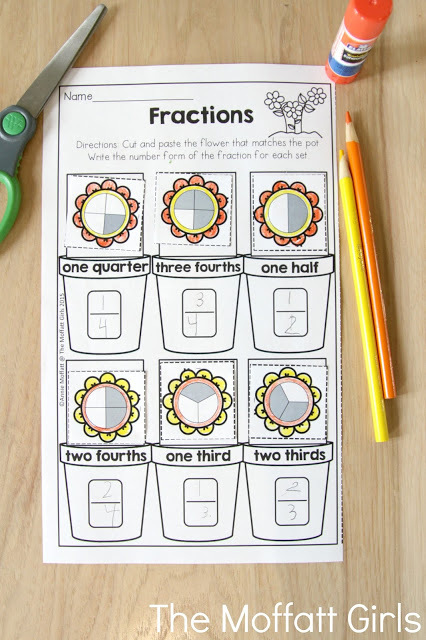 *Fractions: Cut and Paste to Match- Cut and paste the flower that matches each shaded fraction. 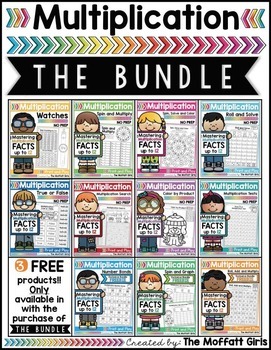 *Multiplication by 2’s (Doubles)- Solve the multiplication problems as fast as you can. 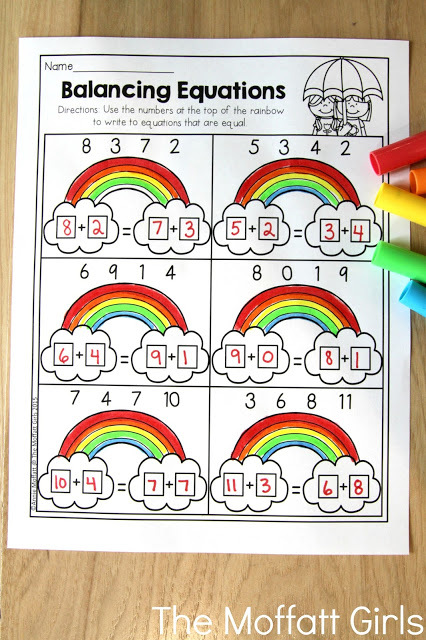 *Color by Multiplication- Solve the multiplication facts and color by the product color code. 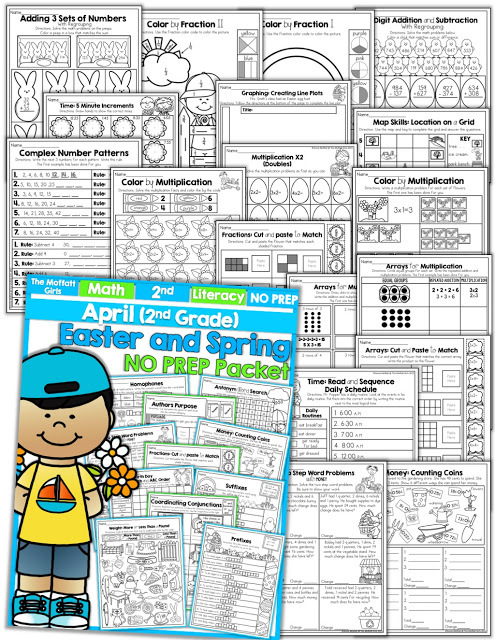 *Complex Number Patterns- Write the next 3 numbers for each pattern. 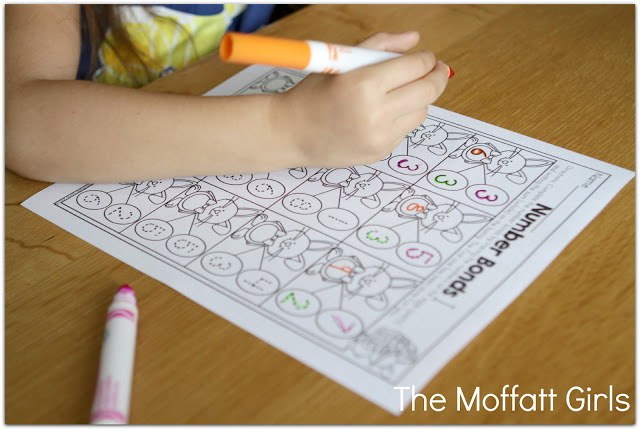 Write the rule for the pattern. 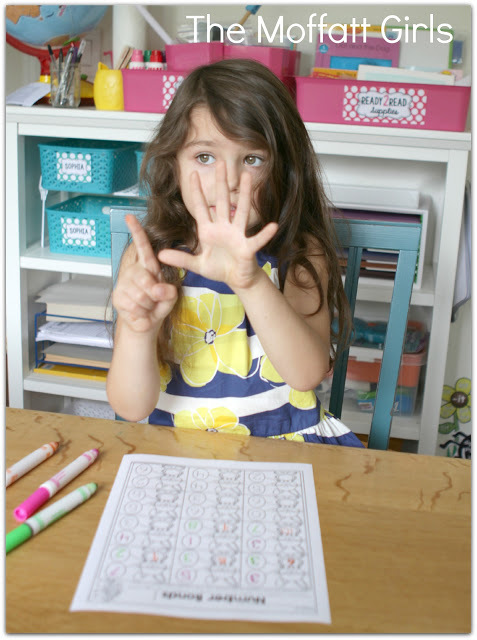 Part 2: Follow the rule to write the next 5 numbers. 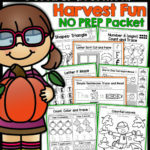 *Graphing: Creating a Line Plot- Follow the directions by using the given information to create a line plot. 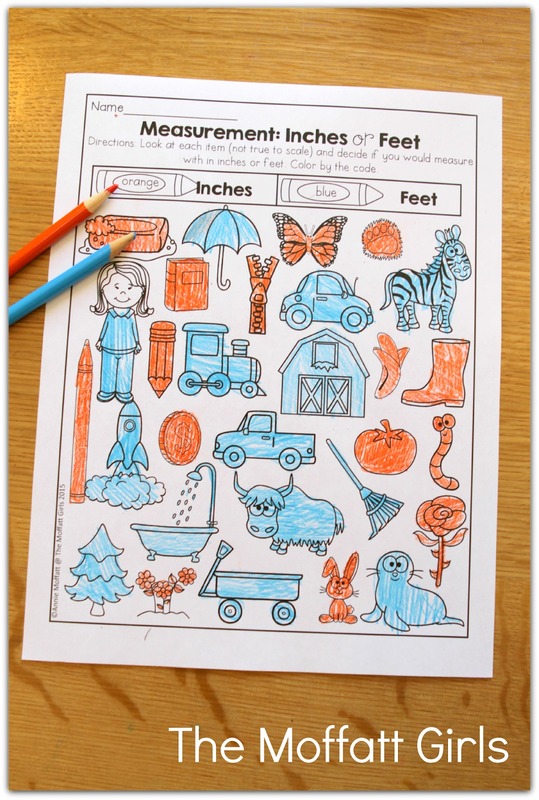 *Time: 5 Minute Increments- Draw hands to show the correct times on each clock. 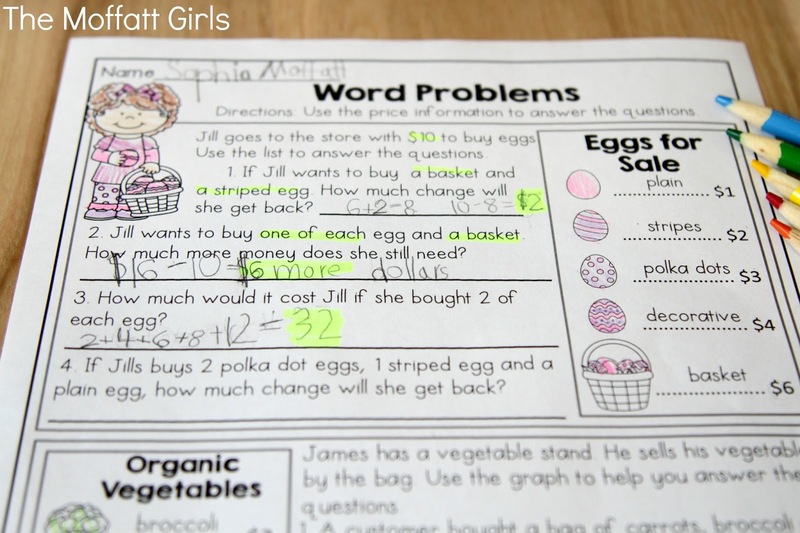 *Two Step Word Problems with Money- Solve the 2 Step word problems and write how much change is left over. 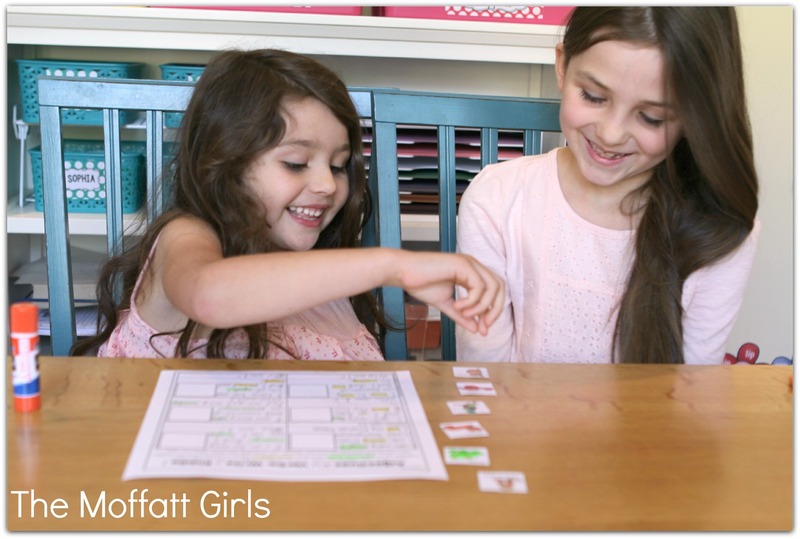 *Map Skills – Location on a Grid- Use the map and key to complete the grid and answer the questions. *3 Digit Addition and Subtraction with Regrouping- Solve the math problems on the eggs. 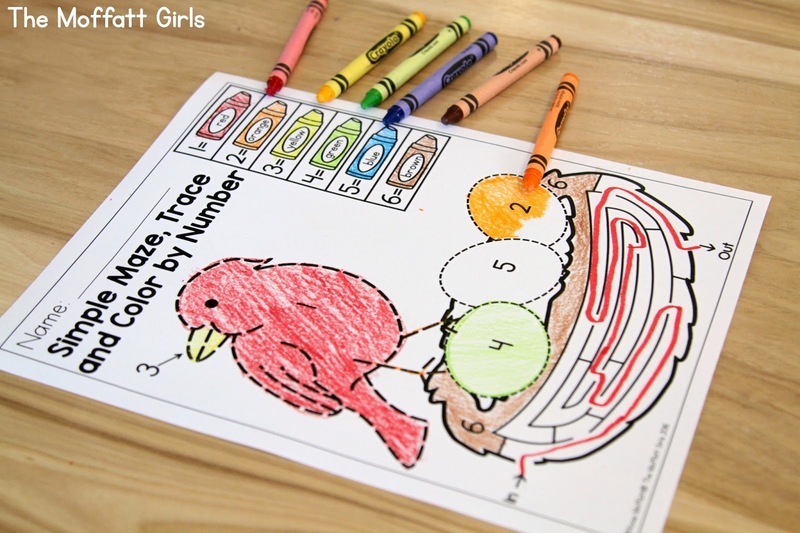 Color a chick that matches the sum or difference. 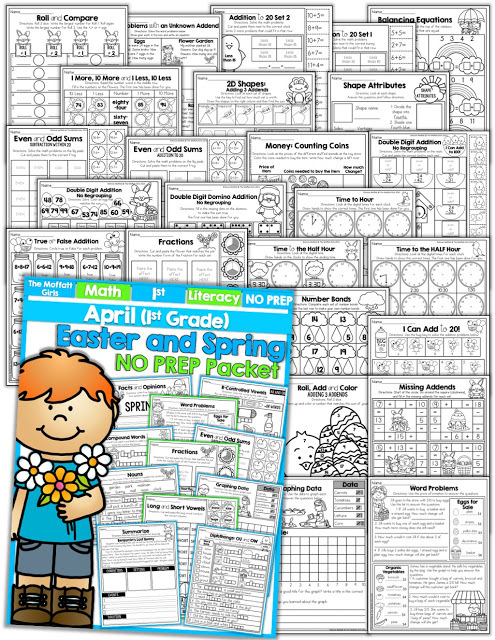 *Money: Counting Coins- Find 6 different ways to spend up to 98 cents in gardening supplies. 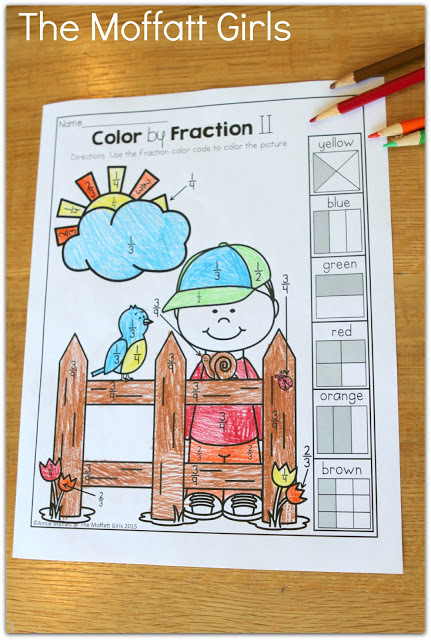 *Color by Fraction I – Use the fraction color code to color the picture. *Color by Fraction II – Use the fraction color code to color the picture. 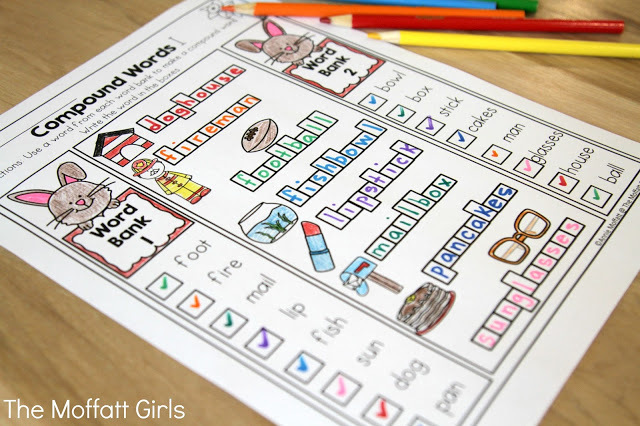 *Illustrated word bank to help spell words they might use in their writing. 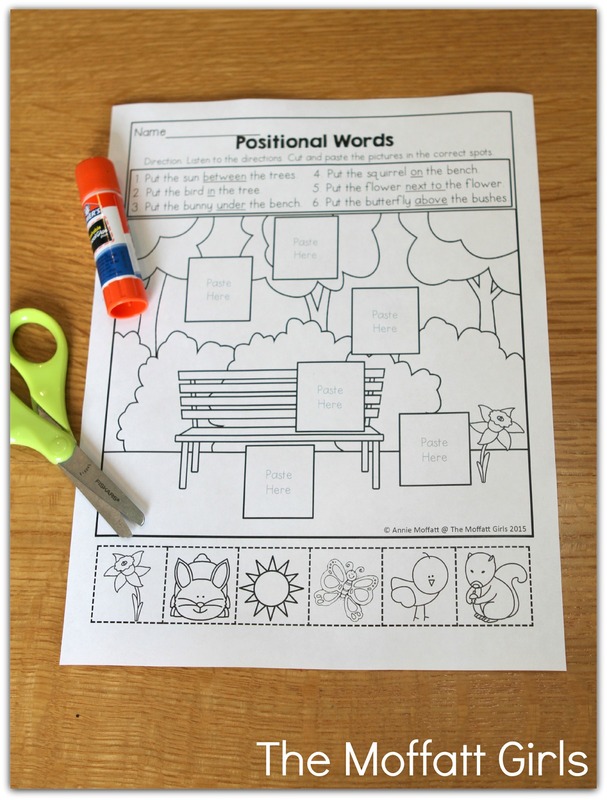 *Place to draw a picture to support the writing. 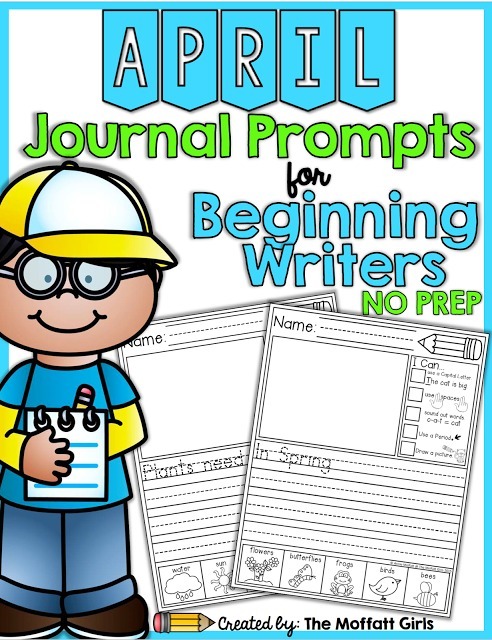 ***Each of the above starter prompts also come WITHOUT starter sentences for more advanced writers. I am impressed by your work and creativity. 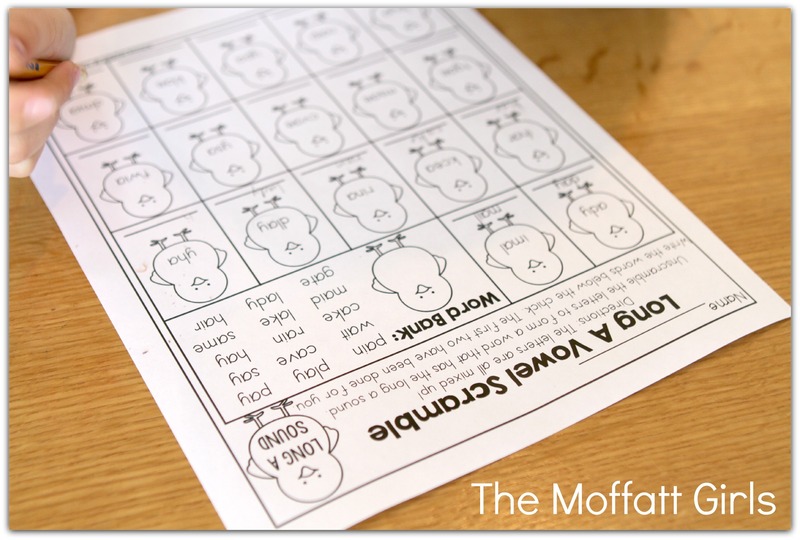 I use your worksheets in work with my students with disabilities.It misses the pictures of your little girls and made sheets. Hi I’m a first year Kindergarten teacher and I was wanting to know if you had your positional words activity in a separate document in your TPT store? Thank you. 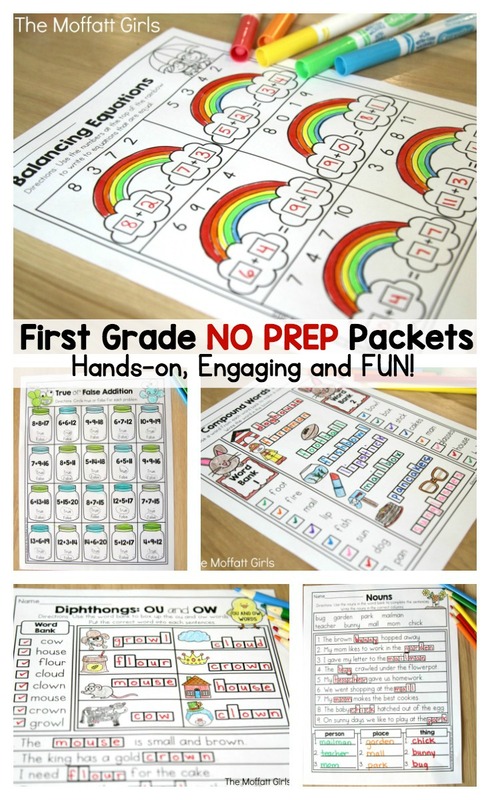 I don’t have individual worksheets available for sale. The sheets are only for sale as a complete packet. 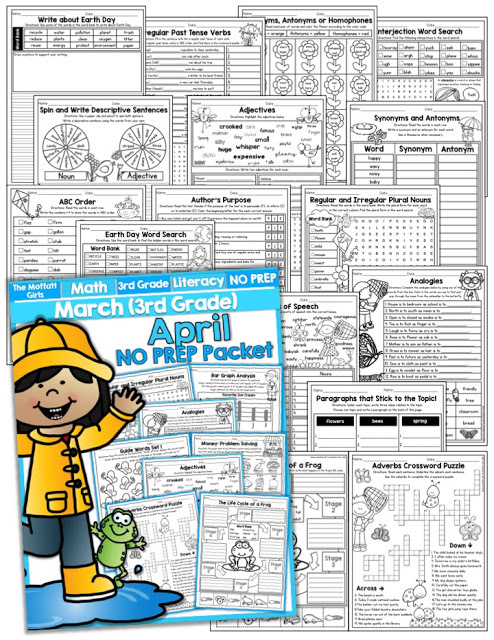 I have worked hard to make sure that each worksheet within a packet would meet the general needs for that age group and subject, though. I hope that helps! 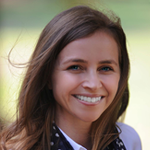 The best way to get freebies is to join my email list at the top of the main page.